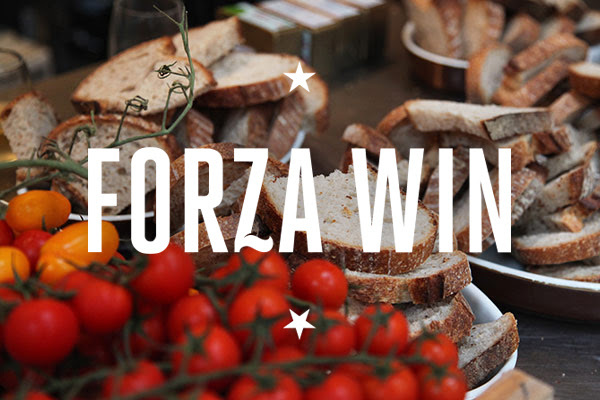 Faithful readers will remember that last November I went to Forza Win(ter) – a family style Italian dining experience courtesy of Forza Win. Well, I had the pleasure of another Forza Win dinner last week. It was a delight (as the Forza experiences always are!). The company was grand, the food was delicious, the drinks were tasty, the after dinner music was utterly enjoyable. Perhaps more than anything, though, I was delighted that this feast featured panzanella. At my first Forza Win experience (CUTS, last summer), they served an INCREDIBLE, crazy addictive panzanella. The copious amounts I ingested undoubtedly played a large part in the painfully overfull feeling I had at the end of the night. But seriously, it was SO GOOD. So when it showed up on our table again last week, I was a very happy girl. Given that I fell in love with the panzanella at CUTS last summer, it’s strange that up to this point I had never attempted it at home. Having it again last week prompted me to do just that. On Saturday evening, Louise and I had Danny and Marie-Laure (of the long walk fame) over for dinner, which seemed the perfect opportunity to try my hand at panzanella. 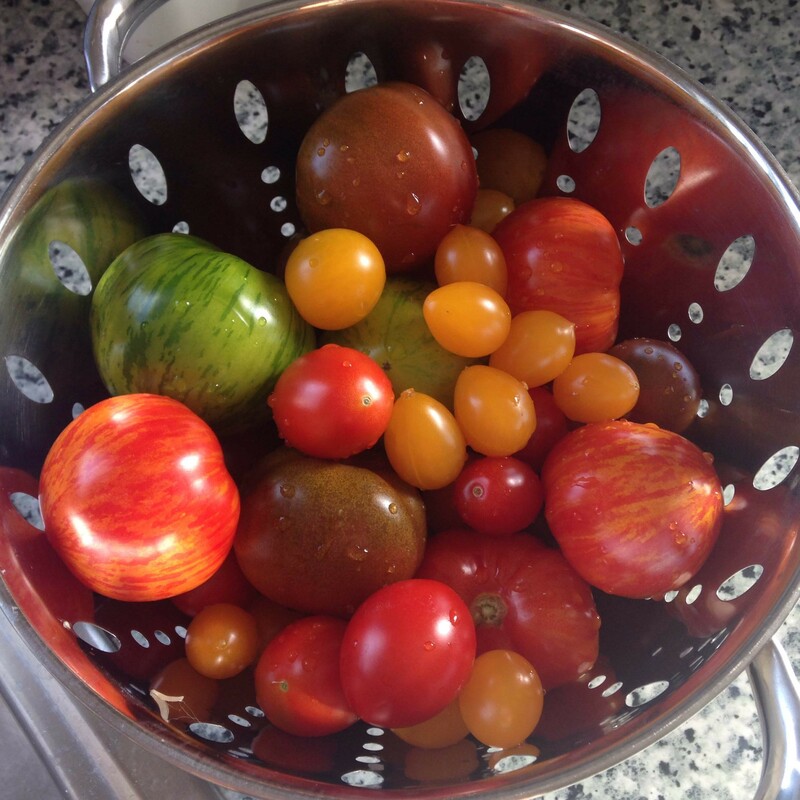 I took myself down to the square and bought a load of tomatoes in various colors and sizes. Yay! Besides the tomatoes, the essential ingredient is obviously the bread. Some recipes said to just use stale bread, but the best part of the Forza version is that the bread is damp with the dressing but still slightly crunchy. If you were to use just stale bread, I think it would get too soggy. 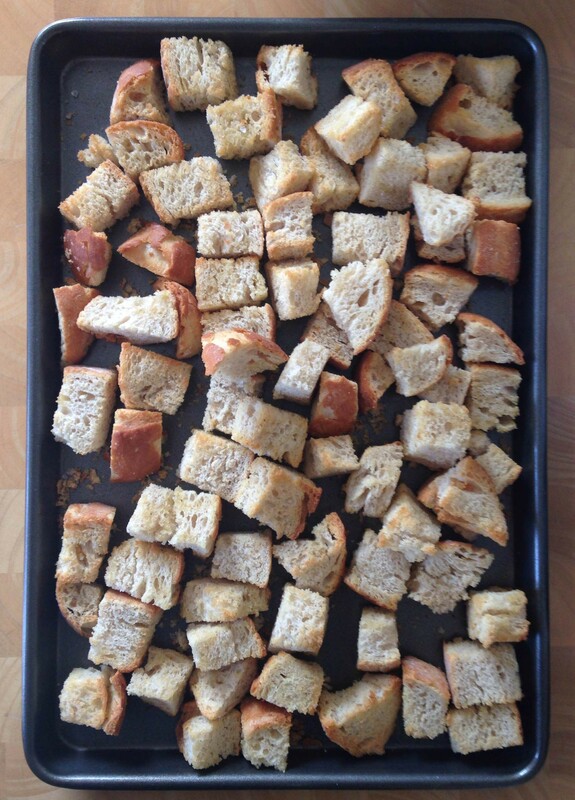 So I took my cue from the recipes that suggested cutting the bread into chunks and toasting it up in the oven, crouton-style. I tossed the pieces with a little olive oil and some salt and pepper and toasted them in a 350F oven for about 15 minutes. I didn’t strictly follow any one recipe, but I drew a lot from the Guardian’s Felicity Cloake and from Jamie Oliver’s version. I kind of played it all by ear, given that I was using all tomatoes and no peppers. The details that follow here, then, are vaguely what I did. Given the rustic nature of panzanella, I think it’s appropriate to just kind of feel your way through it. 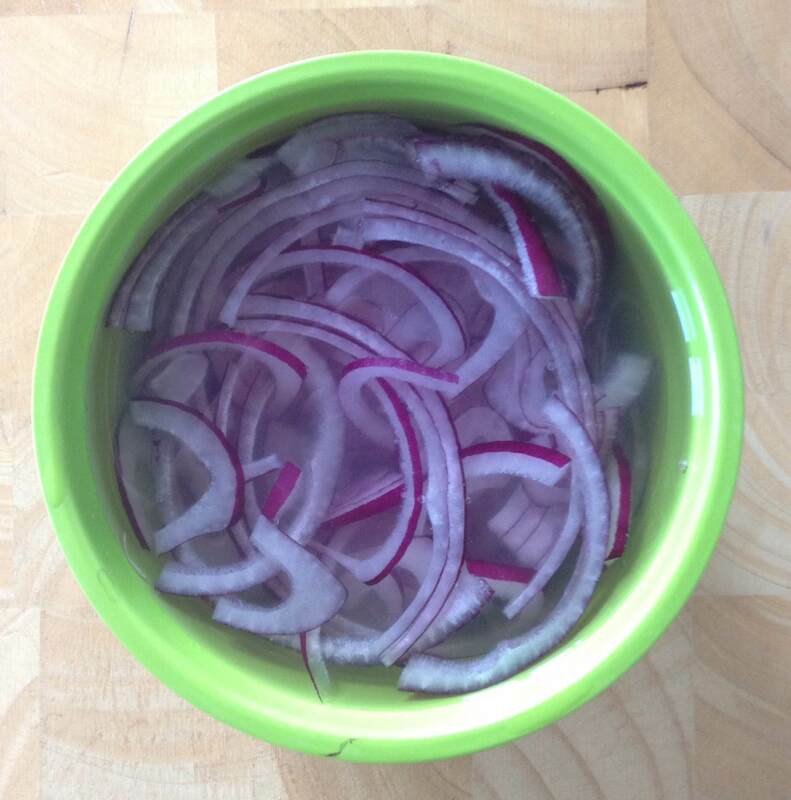 Felicity Cloake suggests soaking the onions in lightly salted cold water for an hour before using, in order to get more of a sweet flavor without the intense onion-ness. I did this, but I didn’t feel like it really got rid of the strong flavor. In fact, I thought the onion was too strong in the final product. The onions in Forza’s version are really thin, soft, and mellow. I don’t know if they cook them slightly before using or what, but that’s what I’d like to achieve in any of my future panzanella attempts. Soaking the onions (and toasting the bread) was really the only time consuming step in the whole process. Otherwise it’s pretty quick and simple. Chop the tomatoes into chunks (I left some of the smaller ones whole), and set in a colander over a bowl, so some of the juice can drain out. Again, aren’t they so so pretty!? Put the bread into a bowl and toss with the vinegar to moisten (I used white wine vinegar because that’s what I had, but I think red wine vinegar would work just as well – probably even better). Drain the onions and add them and the capers (drained of any excess liquid) to the bread. Give the tomatoes a toss and apply a little pressure to drain out any excess juice, then dump the tomatoes in the bread bowl. Add the garlic and chopped anchovies to the tomato juice. Whisk in the olive oil and season with salt and pepper to taste (if you’ve toasted the bread with salt/pepper already, then go light with it here). 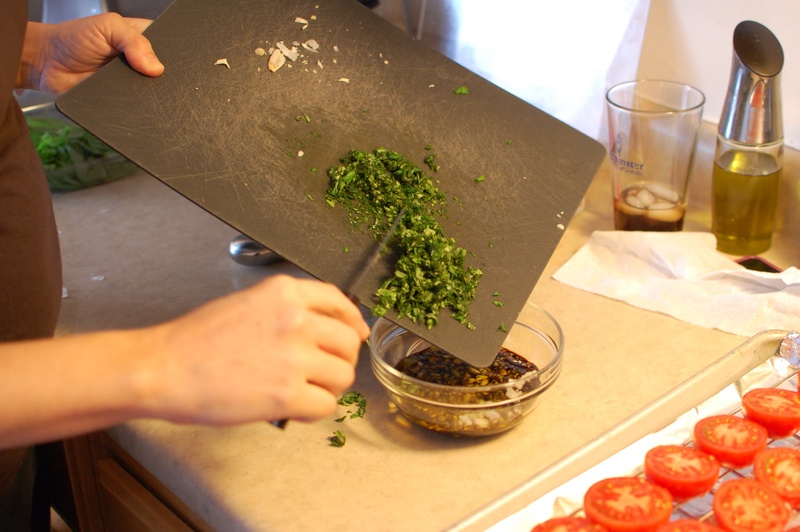 Pour the dressing over the bread and tomatoes and give it a good toss. Leave it to sit for 15 minutes or so before serving, so that all the flavors can meld and the bread has time to soak up the liquid. Don’t leave it for too long, though, because you don’t want soggy, mushy bread. For the same reason, it won’t keep overnight. In other words, eat it all up the same day you make it. I won’t pretend it was as good as Forza’s, but I was pretty pleased with this first attempt. Next time, I’ll go lighter on the onions and perhaps a little bolder with the dressing. I’m gonna be chasing that Forza panzanella dream until I nail it! What about you? 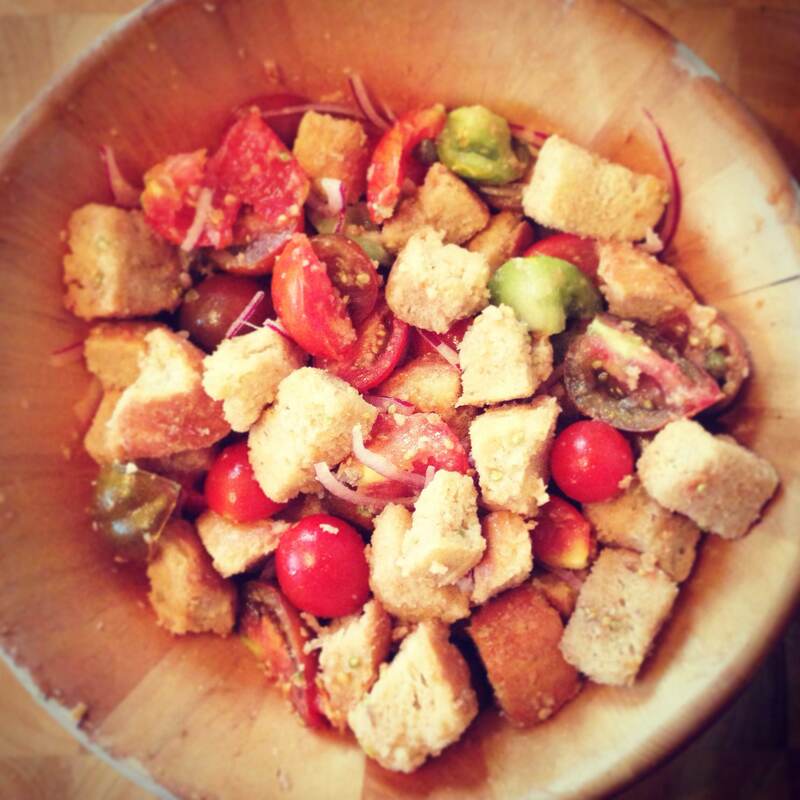 Have you ever made panzanella? Do you have a favorite recipe? 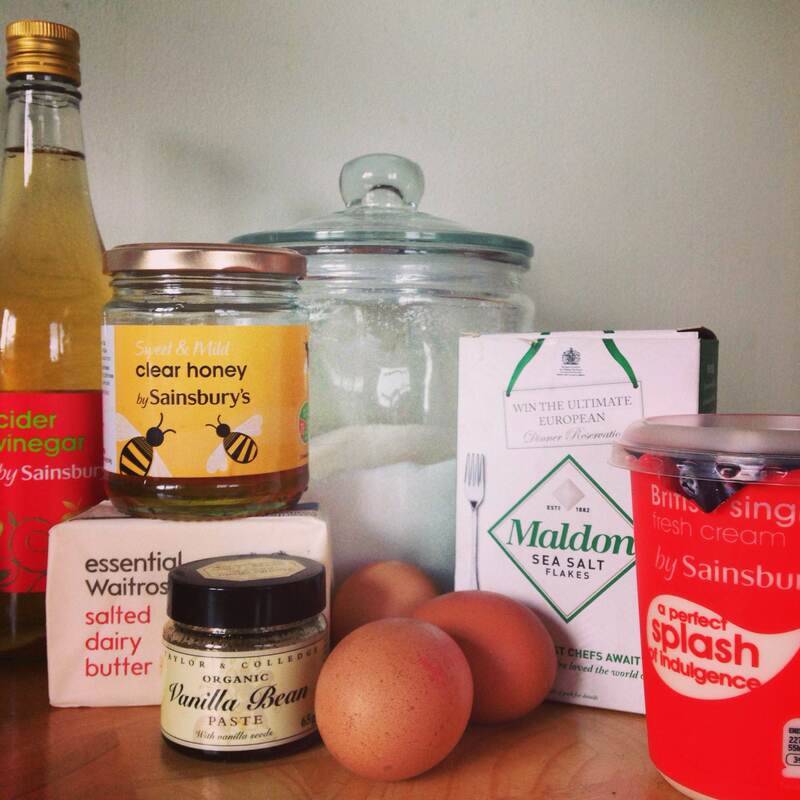 Have you ever attempted to recreate a restaurant recipe at home? See Sister Love Rioja Tapas Fantasticas! So Saturday was a pretty great day. 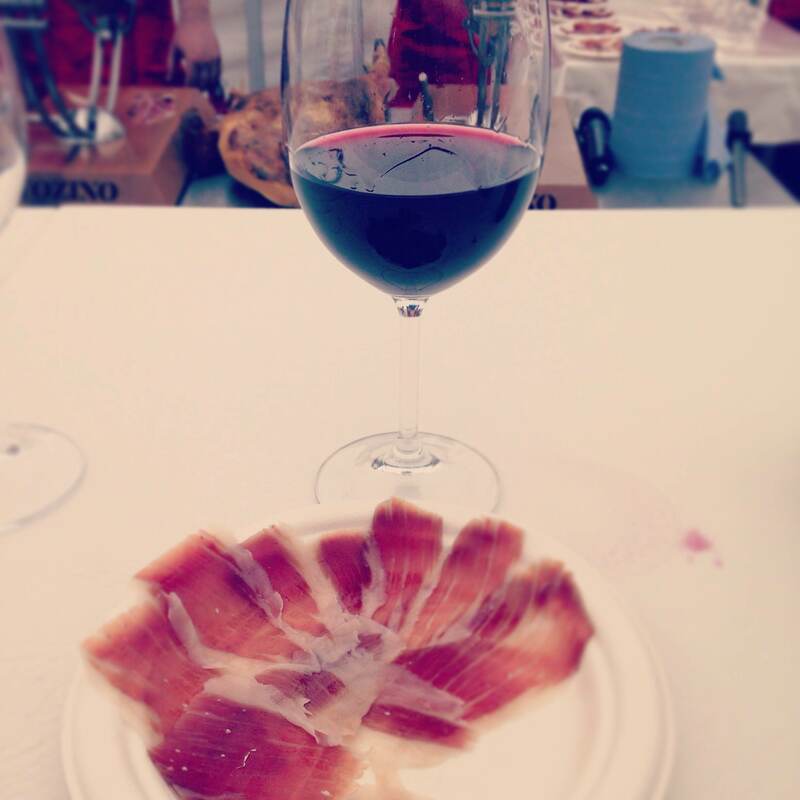 I spent the day sampling Spanish food and wine from Rioja at the Rioja Tapas Fantasticas festival near Tower Bridge. As the name promised, it was fantastic. 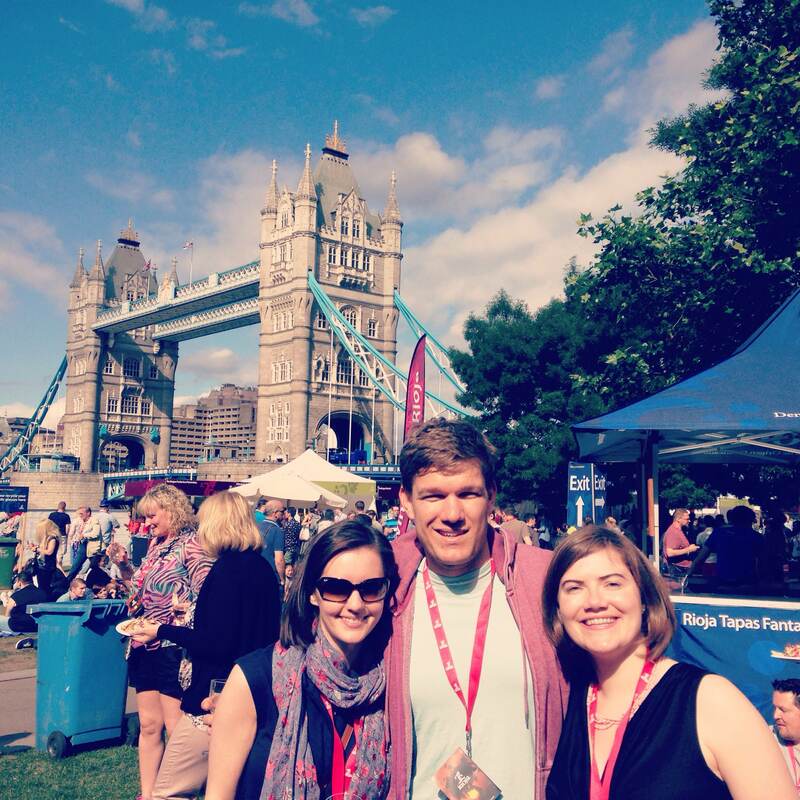 The festival, now in its seventh year, takes place at Potters Fields, a green area at the southern end of Tower Bridge. Potters Fields is a great little public space with lovely views of Tower Bridge and the Thames. There is often some fun activity happening there in the summer, particularly on the weekends. During the Olympics, they set up big screens for public viewing. They do the same every year for Wimbledon. I watched Andy Murray’s victory there last year in the blazing sun with a bunch of happy Brits. A couple weeks ago on Sunday evening, Louise and I spotted a random dance party complete with DJ as we walked home from church. Naturally we joined it and boogied until they stopped playing. I am still unclear on what it was exactly. 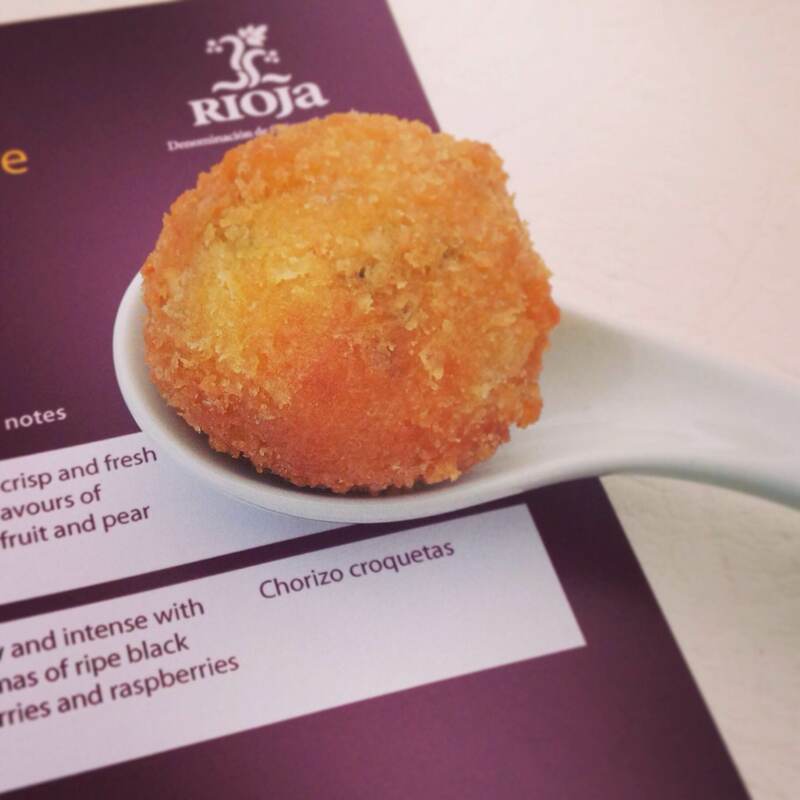 All that is to say, Potters Fields is a fun spot and Rioja Tapas Fantasticas is a particularly great use of the space. Louise has gone for a few years now. I was very sad to miss it last year, so I made sure to sign up for the fun when it rolled around this time. While Lou had booked a wine tasting in the afternoon for a bunch of friends, we saw no reason to limit ourselves and decided to head up earlier in the day to take advantage of all there was to see. 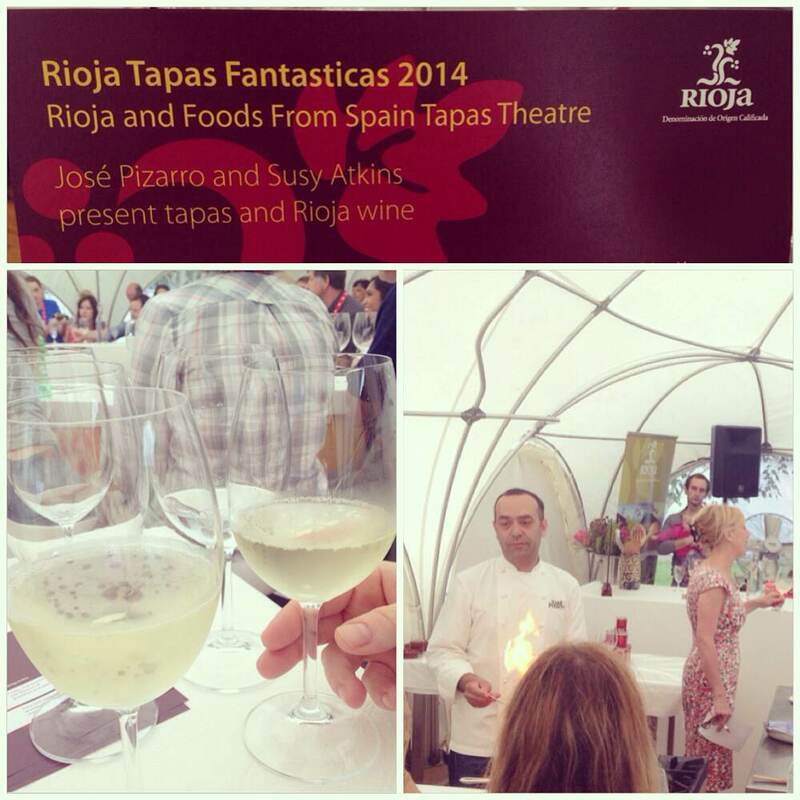 We started at 12:45 with a tapas and wine demonstration presented by Jose Pizarro and Susy Atkins. Jose owns two restaurants on Bermondsey Street (aka our neighborhood): Jose and Pizarro (get it??). Susy is a wine expert who writes a regular column for the Sunday Telegraph magazine, among other things. They bantered and chatted away while Jose cooked up some yummy food and Susy told us about the wine we were sampling: Decenio Blanco and Faustino Rivero Rosado. 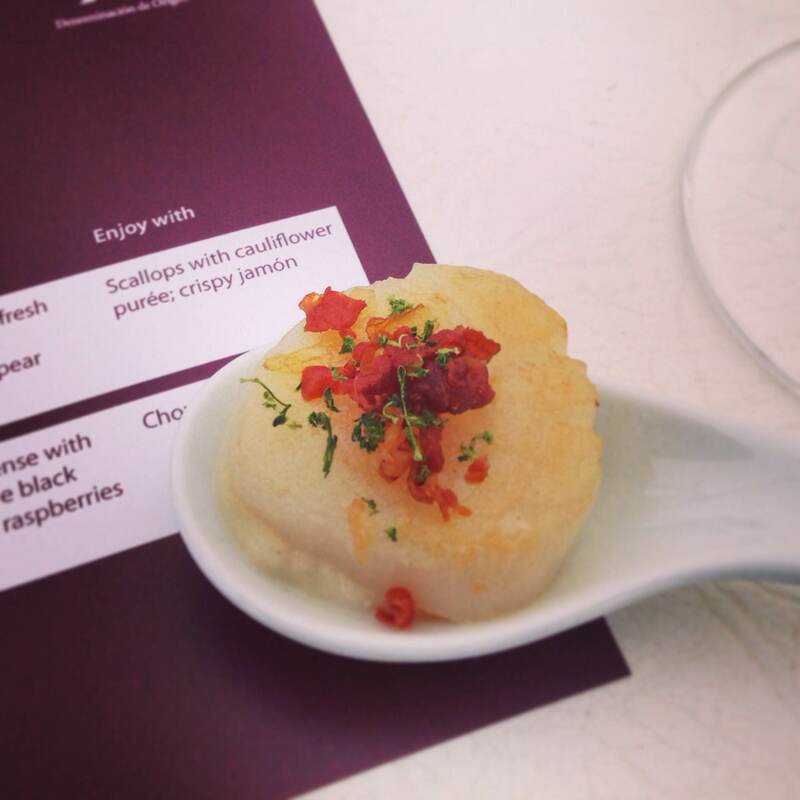 Jose talked us through preparing scallops with cauliflower puree and delicious chorizo croquetas. Both were amazing. I nearly bought the cookbook on the spot. We had such a lovely time at the tapas demonstration that we immediately decided to return for the Ibérico ham carving masterclass 30 minutes later. 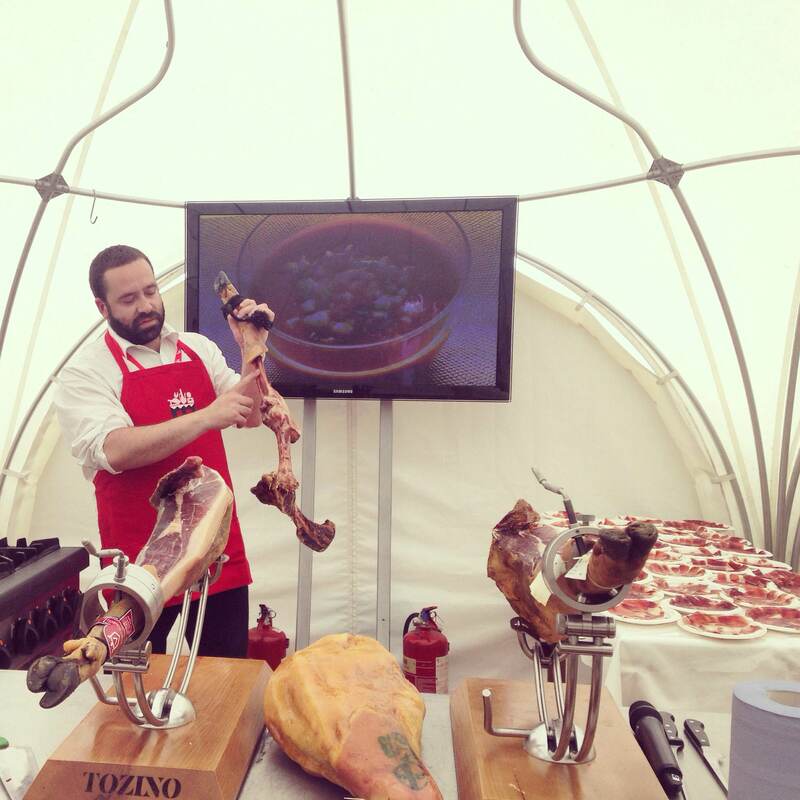 In that class, presented by Chuse Valero from Bar Tozino (another local spot), we learned ALL about Ibérico ham. Chuse told us all sorts of interesting things and by the end of the class basically had us convinced that we need to invest in a whole ham and carving stand for our at-home snacking pleasure. I took notes and Louise made fun of me, but I don’t care. We learned that Ibérico ham comes exclusively from specially bred black Iberian pigs; it is aged for a minimum of 3 years; the flavor and desirability depends on whether the pig is acorn-fed (this is the top-of-the-top) or grain/acorn-fed or grain-fed; and that within a single ham, there are 12-15 different textures and flavors. We also learned all about the two different styles of knives you need; how to make the first cut; how to cut around the tricky bone/tendon sections; and what to do with the bones once you’ve managed to strip them of all that tasty meat. Oh and we got to eat two plates of the ham and had two more glasses of wine: Navajas Crianza and Berberana Carta de Oro Tempranillo. The crianza was really good – interesting and different. The color was quite yellow and the flavor was robust/oaky. And of course, the ham was amazing. After that class, we had some time to kill before our wine tasting class. 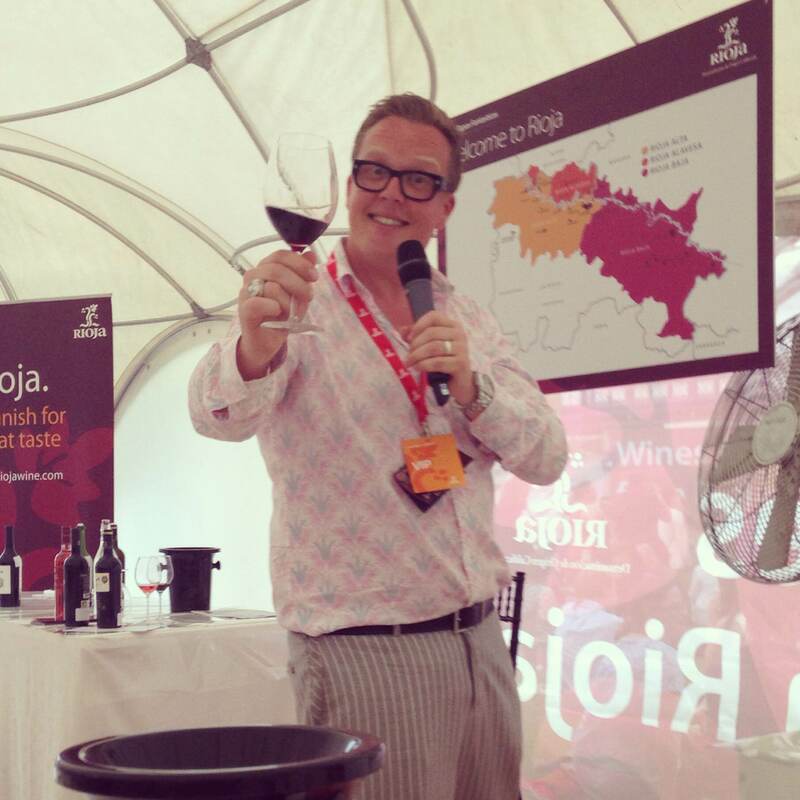 As other friends started to arrive, we milled about a little bit, sampled some of the food on offer around the fair, and then headed to the wine tasting tent for a session with Olly Smith, a wine expert/columnist/TV personality and all around delight. He talked us through five different wines from Rioja, including one from Vivanca, a vineyard that features a glass elevator which takes you underground! 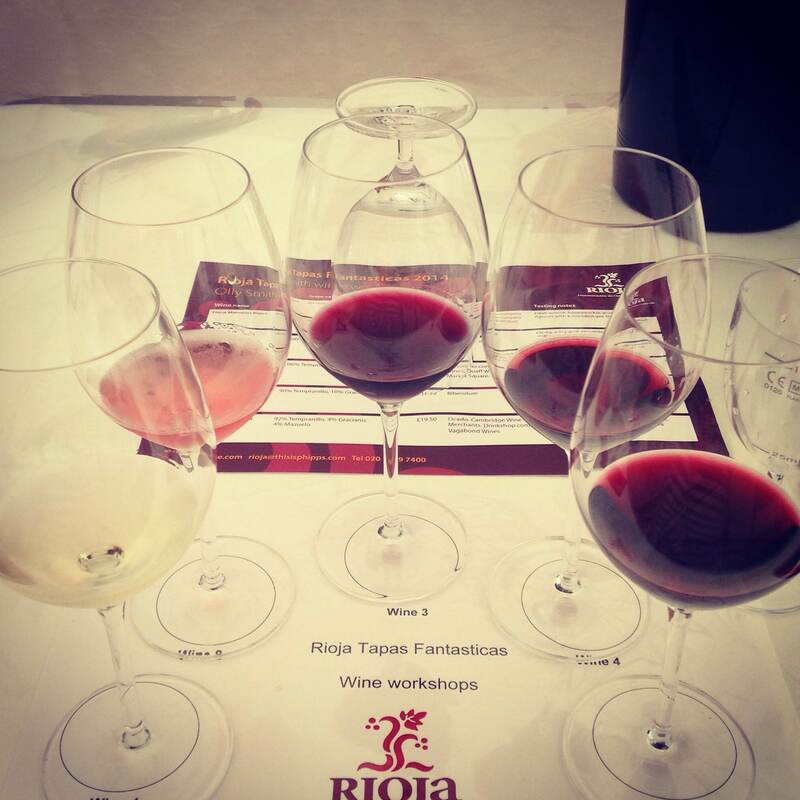 Per Olly, it is a “Gotta go!” if you visit Rioja. He also told us which wines smell most like a puppy (South African, earthy). All-in-all, a really lovely day. The sun even decided to come out in the afternoon – how nice! Sarah, Mitch and Lou – representing half of our jolly group. I don’t think it’s overstating things to say I am eternally indebted to Louise for bringing such a fabulous, happy event into my life. I’m DEFINITELY going back next year. Okay, so I didn’t actually drink 100 martinis. If I had, you would have just cause to use this blog post as part of a necessary intervention. 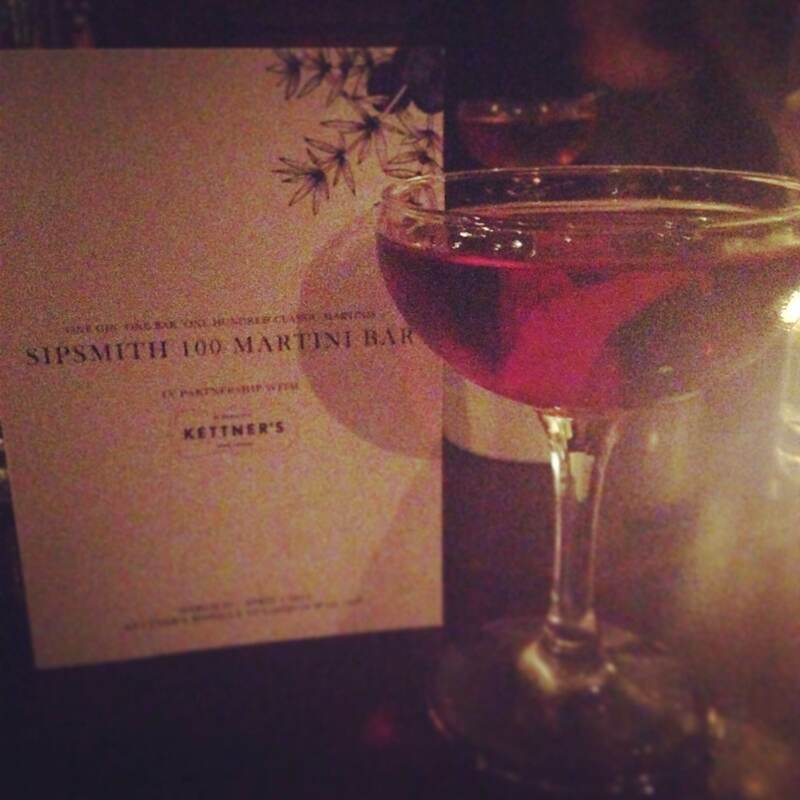 But last Wednesday I did go to a special evening that featured 100 different martini recipes: the Sipsmith 100 Martini Bar. Don’t worry, I only tried two. 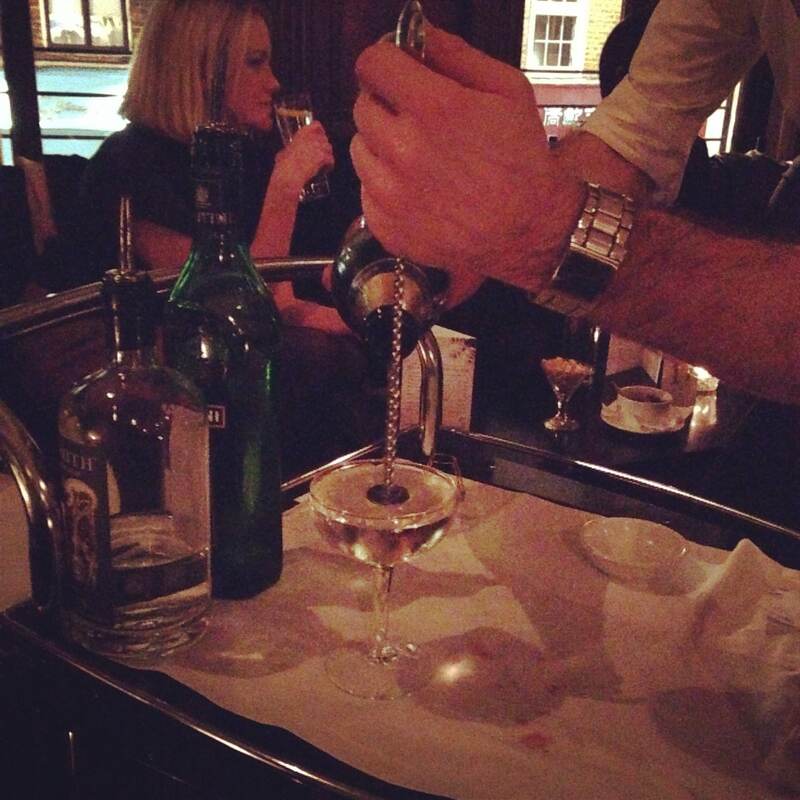 Hosted by Sipsmith Gin in the private upstairs Apartment at Kettner’s (a London restaurant/bar, established in 1867), the evening was all about showcasing Sipsmith Gin and the classic gin martini. 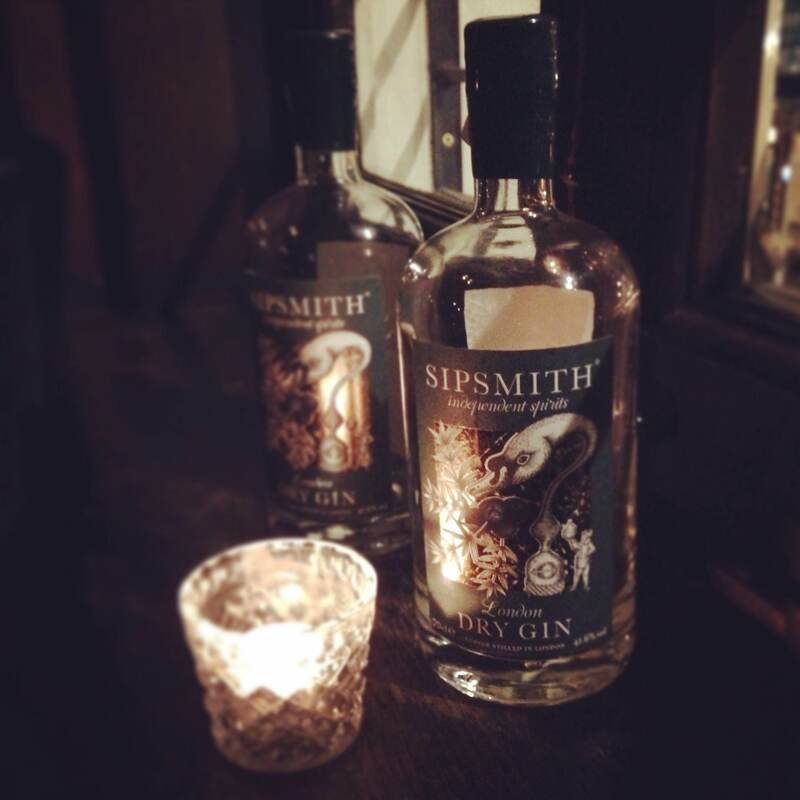 So yes, it was definitely a promotional event for Sipsmith*, but it was also a fun evening out! It was a little weird that I went along to this at all, actually, as I am really not into martinis or mixed drinks in general. I’m much more a beer or wine kinda gal – liquors just not really my thing, save for a G&T or margarita here and there. But Louise and a couple of friends were going, so I said why not? It was billed as something of an event, so I was intrigued. 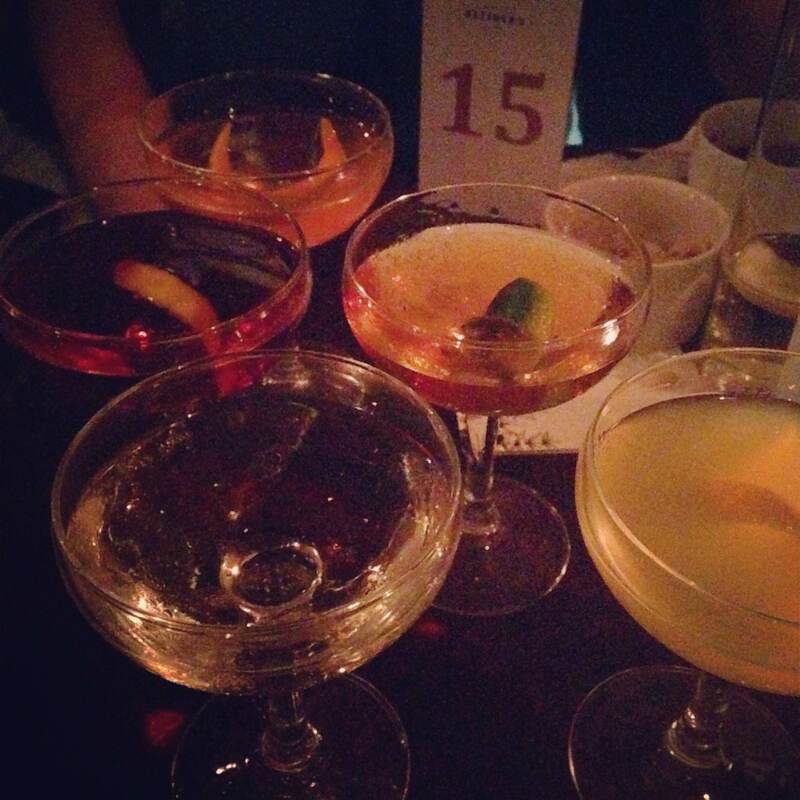 So what made it more than just a bar with an extensive martini list? The experience, obvs! First, the environment was retro and cool. 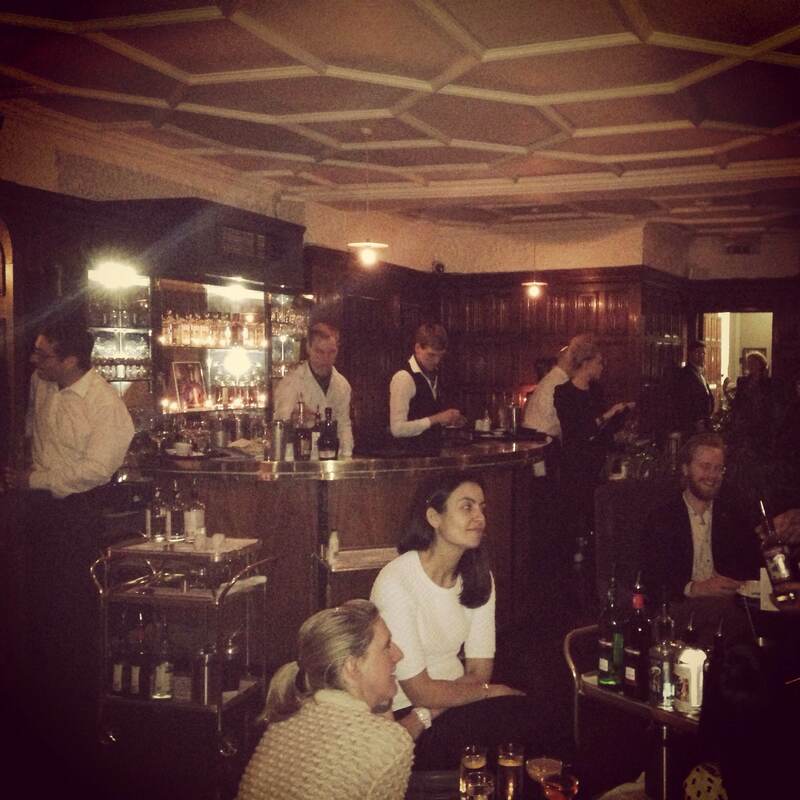 The dark paneled walls; mismatched, crowded seating; leafy ferns; dim candlelight; and bright, semi-circular, Art Deco-style bar gave the whole place a private library meets speakeasy kind of feel. This picture really does NOT do it justice. 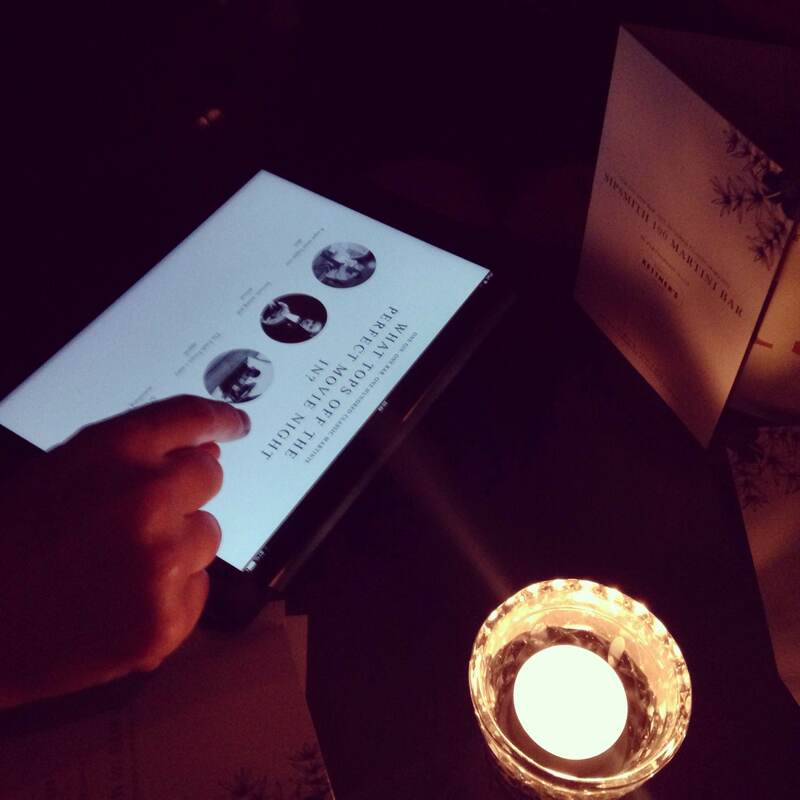 While the ambience was very early 20th century, the ordering process was very early 21st century. We were handed an iPad, from which we placed our orders. We could choose via an “I’m Feeling Lucky” option, which would randomly bring up three martinis that we could choose between, or via a short questionnaire that asked us personality-type questions and then would spit out three suggestions based on our answers. You could always start over if you weren’t happy with the choices. Once we had made our choice, we made it official by entering our names. I went with the quiz option. The questions were of the really leading variety, like the kind you get in teen magazine quizzes. You know the kind I mean…the ones where the answers clearly point to specific “types” like the popular girl, the sporty girl, the smart girl? So if you answer “What’s your favorite thing to do on your own?” with “Read a book”, and “What do you look for in a guy?” with “Intelligence”, you’ll end up with a result that tells you to join the debate team or to go for quiet, aloof guy – he’s misunderstood! he has hidden depths! you’ll have intellectually stimulating conversations! – or something equally pigeon-holed. Aaaaaaanyways, my leading questions led me to choose a martini called the Millionaire. What does that say about me? I’m a gold digger? Guilty. Once everyone had chosen, the iPad was collected and we waited patiently for our drinks. Patience was required as it took quite awhile for them to arrive. But when they did arrive, that’s when the real fun began! See, they didn’t come to our table already made. No, no, no. The drink makers (bartenders? mixologists? cocktail dudes?) 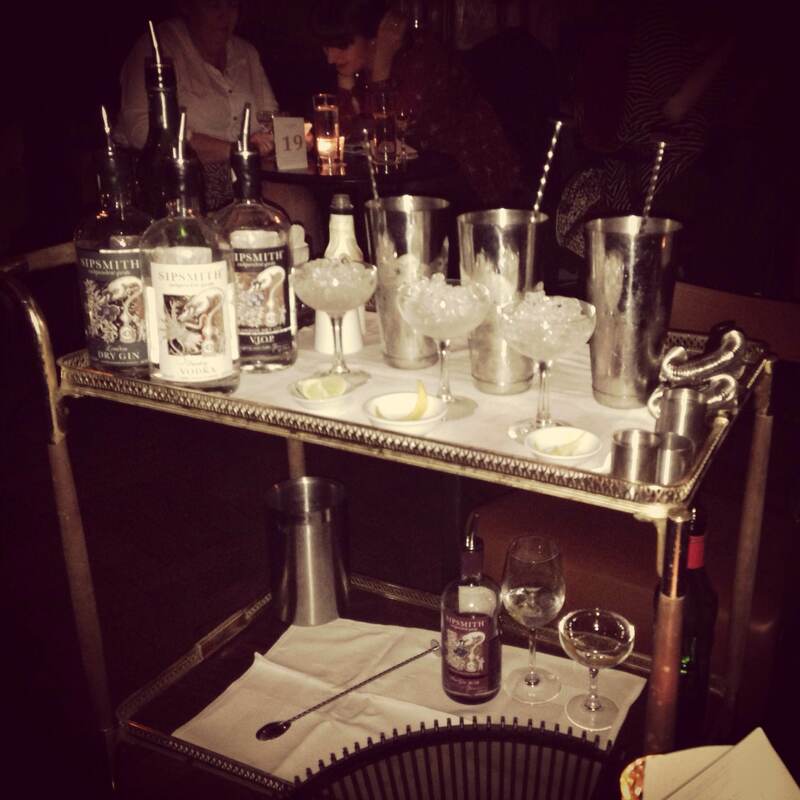 wheeled a little trolley over to our table with all the necessary ingredients and made our drinks right in front of us! While teaching us things (education!) like the history of the drink and the different types of gin/vermouth/whathaveyou that they were using. And that’s it, people. No garnish; no fancy cocktail-making flair; no nothing. Just alcohol. And it’s purposefully layered so that as you drink it the flavor changes. I was skeptical about this whole layering thing. Surely it would all just mix together once it was in the glass, right? Wrong! As I sipped and progressed through the glass, the flavor definitely changed. Very interesting. I also learned during the making of mine that vermouth is a fortified wine, so – much like any wine – it will go off after awhile. Obviously, this doesn’t happen as quickly as regular wine, but it shouldn’t be kept in your liquor cabinet for forever. Apparently, it will last for about a month without any ill effects, and then it will start to slowly go off. So there’s a tip for ya. Everyone else’s martini had more visual interest than mine. They were all fun colors and had some sort of garnish. I didn’t really listen to any of their recipes, though, so I can’t tell you much about them. I do know that Lou’s was called the Suffragette (which just makes me want to break into song), but that’s about all I know. We sat and sipped and chatted and had a grand old time. As we all liked our first choices pretty well, we decided to go for a second round. Mistake. Our second choices were just NOT as good. I went for the Princeton, partially because “Hey! My dad went to Princeton!”, but also because it sounded good. It had port, and I was intrigued by how the sweetness of port would taste with gin. The answer is: really not great. And SUPER SUPER SUPER strong. It was literally just gin and port with a little twist of orange peel that basically did nothing. It tasted like paint thinner. I couldn’t finish it. Generally, we were all dissatisfied with our second choices. Oh well. The first ones were good, and overall, it still made for an out-of-the-ordinary (in a good way) Wednesday night. This is the Princeton. Steer clear. *And this is definitely just a post about my experience, not an affiliate post. Lately when it’s time to plan dinner and I am feeling uninspired, I turn to Pinterest. I love the fact that I can type in “best pork tenderloin marinade” and I get hundreds of fresh ideas for how to marinate said pork tenderloin. I realize you can do this on allrecipes.com or good ole Google, but Pinterest is my go-to place for recipe discovery. As we transition into Spring/Summer weather (finally!!!) I am excited to transition into Spring/Summer recipes and I thought it would be fun to share a few of my favorite recipes from Pinterest with y’all! So without further ado, and in no particular order, here are my top Spring/Summer recipes from Pinterest. 1. 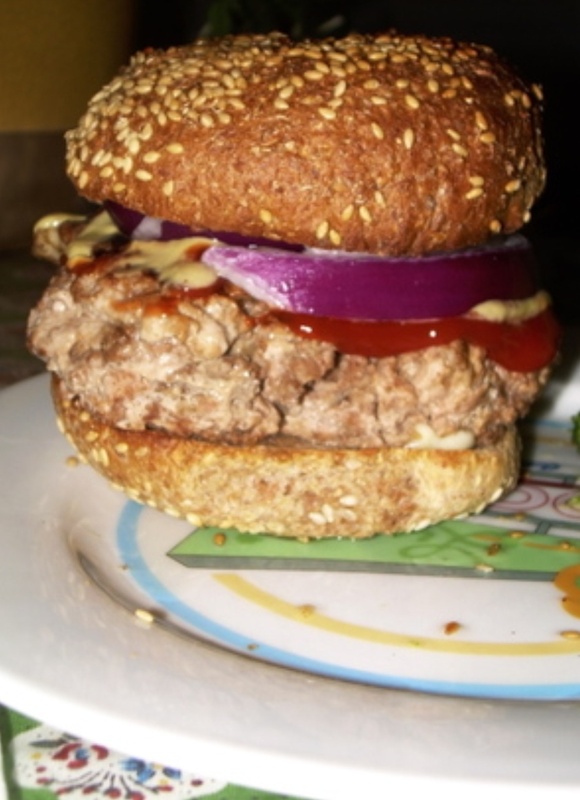 Best Turkey Burger – we LOVE to grill in Spring/Summer and these Turkey burgers are so juicy. Even with the little ‘kick’ from the hot sauce, our kids love them too! 2. 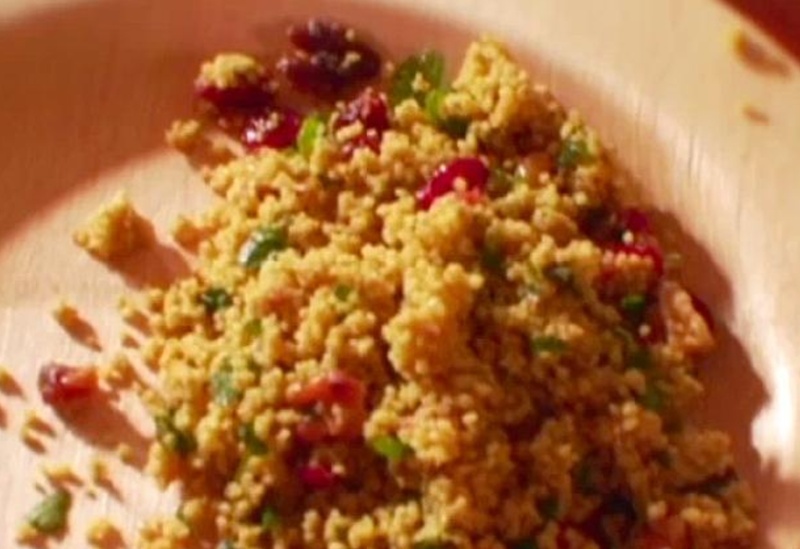 Curried Couscous Salad with Dried Cranberries – This one I actually discovered before Pinterest when we lived in CA. This picture doesn’t do it justice. 3. Grainy Mustard Potato Salad – Okay so I actually found this one before Pinterest too – in a Martha Stewart magazine. 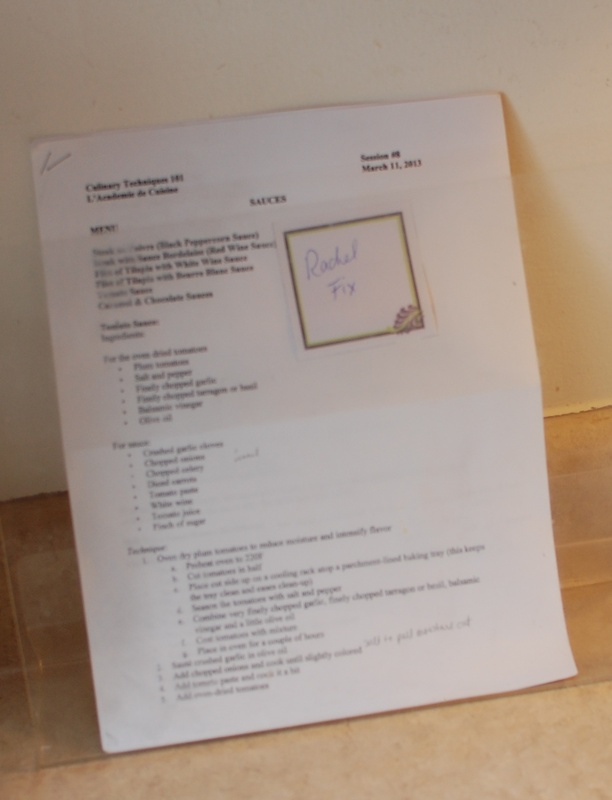 But the piece of paper I have it written on is so small and my recipe collection is so unorganized, so I was always losing it. 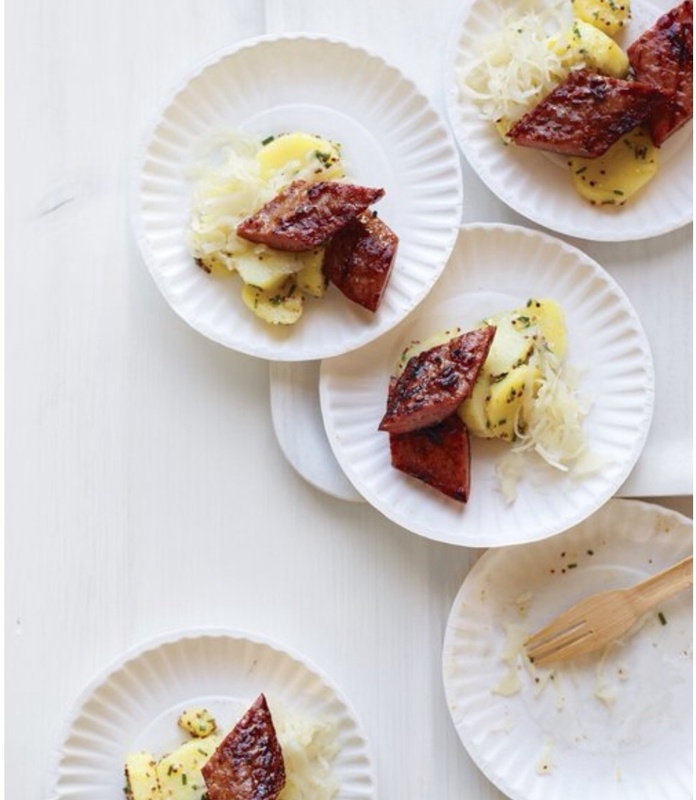 Martha made it as an appetizer with grilled slivers of kielbasa. We make it as a side dish. Sometimes we eat it with grilled kielbasa, sometimes we eat it with the turkey burger above, sometimes we make it as our contribution to a potluck dinner or 4th of July picnic. It is always a hit. Oh and I always multiply the recipe five times(!!!) because grocery stores sell Yukon Gold potatoes in five lb. bags and because we love it so much. If you are gonna make that much, make sure you cut down on the oil – it gets too greasy that way. 4. 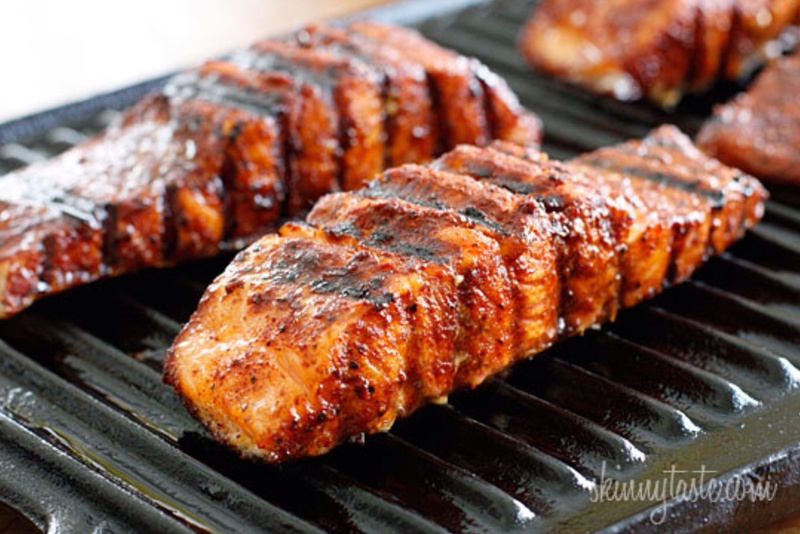 Smoky Spice Rubbed Grilled Salmon. Oh by JOVE this recipe is good! Make it this Summer. You will love it. We had friends over last Summer and (being the wretched hostess that I am!) I forgot to ask if they liked salmon. After we finished the meal, the husband admitted he usually hates salmon but he had me go and print out the recipe righthatminute because he loved it and wanted his wife to make it for them again. I usually double the amount of spices because I love the rub so much! 5. 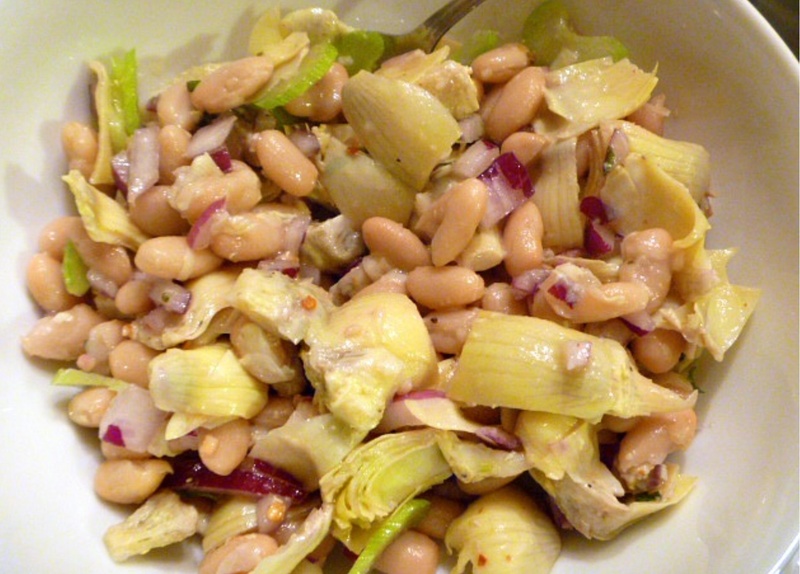 Artichoke and White Bean Salad. If this looks familiar, it’s ’cause I already posted it on this blog. I discovered this one when I was craving artichokes because I was pregnant. 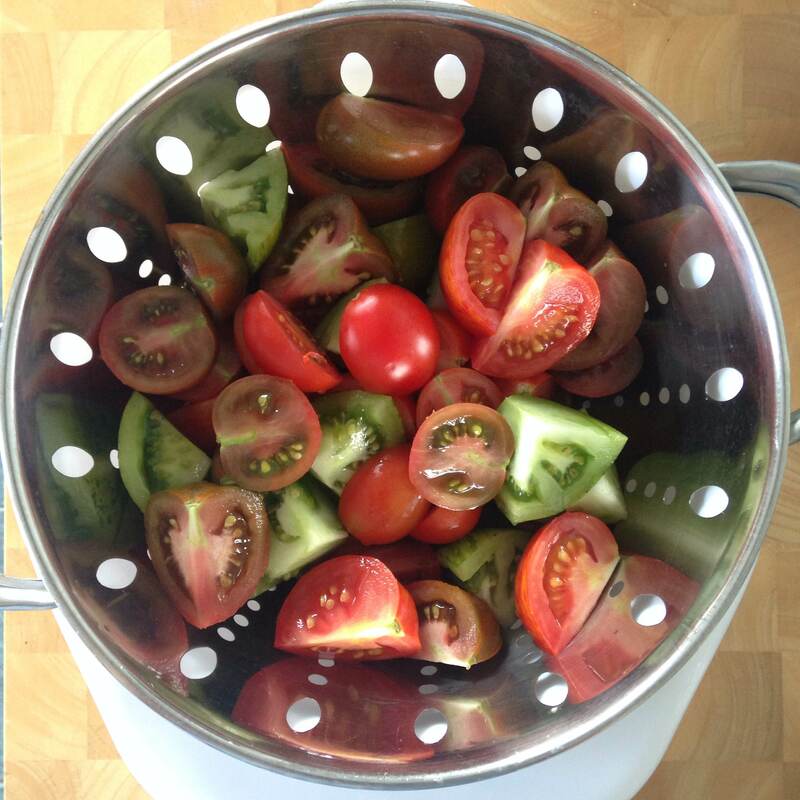 It is so yummy – a great Summer salad. My one tweek is that I added a little honey (maybe a tablespoon?) to cut the acidity and give it a little more dimension. 6. 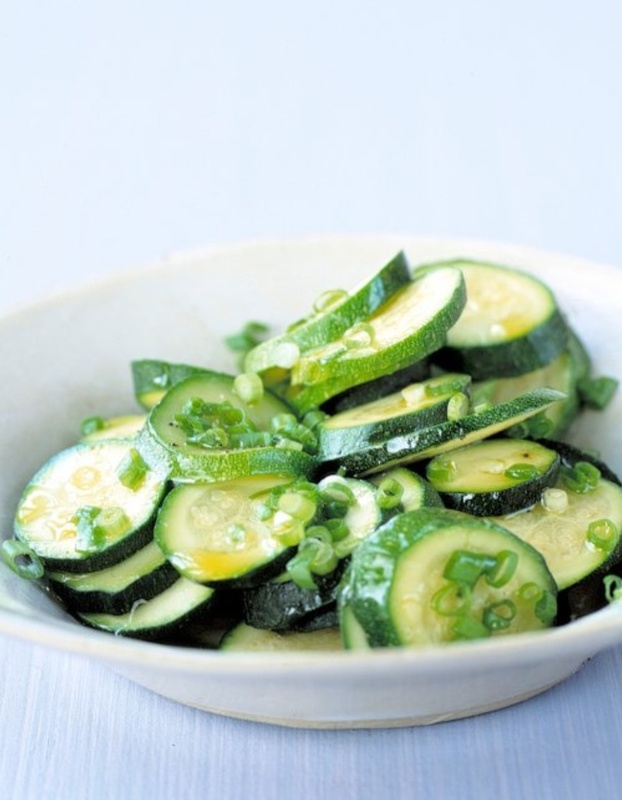 Steamed Zucchini with Scallions – another Martha Stewart recipe, I made this for the first time on Saturday and it was a HIT! Simple, fresh ingredients with lots of flavor. And most importantly, it was super duper easy to prepare! We’ll be eating this one a lot this Spring and Summer! 7. Finally, I haven’t made this White Peach Sangria yet because I pinned it last Summer right before I found out little Mac was on his way. Doesn’t it look tasty though?! Can’t wait to try it! So do you find your recipes on Pinterest too? Any good ones on there that I need to pin? To check out these recipes (and more exciting pins!) on our Pinterest account – search for seesisterblog. Naturally, that led me to look up the eponymous Brooklyn pie shop: Four & Twenty Blackbirds. And I have been living in a constant state of jealousy ever since. Emily and Melissa Elsen are two sisters who set up shop four years ago (in fact, today is the shop’s 4 year anniversary!). They were named Artisans of the Year by Time Out NY in 2011, and they’ve been featured in Martha Stewart Living and on the Cooking Channel. They are basically living my dream and I hate them and I love them and I want to be them and goodnessgracious yummy pie. After I discovered them, I started following the shop on Instagram and I really can’t get enough of all the pie-baking pictures they post. The cookbook has been sitting in my Amazon shopping cart for the past month. I am trying to exercise self-restraint and resist buying it until I’ve made more progress through the three pie cookbooks I already own. But this past weekend, I went and looked up their recipe for Salty Honey Pie online because it just sounded sooooo good. Clearly the self-restraint isn’t really working; I should just buy the book already. A note on the ingredients – the original recipe specified white cornmeal and white vinegar. I didn’t have either but I had yellow cornmeal and cider vinegar. Since the amounts are not huge, I just substituted and I really don’t think it affected the finished product. I also think you could get away with substituting vanilla extract for paste, but you might have to adjust the amounts. Much like the Lemon Lime Chess Pie I made a couple weeks ago, this is a custard based pie. That means sugar, butter and eggs feature heavily, so yeah, it’s gonna taste good. This one adds honey, so yeah, it’s gonna be sweet. 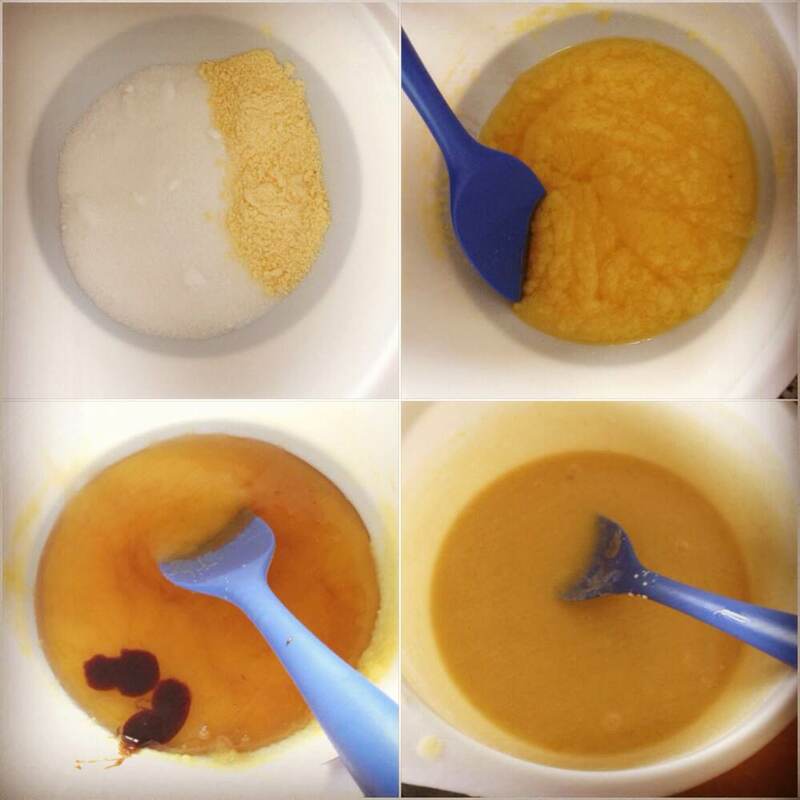 Combine the sugar, cornmeal, 1/4 tsp salt and melted butter (upper right image). Add the honey, vanilla and vinegar and mix together. When I basically doubled the sweetness factor by combing equal parts honey and sugar, I realized just how sweet this pie was gonna be: SUPER sweet. It is not for the faint of heart. Or diabetics. Fold in the eggs and add the cream and the filling is ready to go (bottom right image (See? Not very interesting pictures)). The recipe calls for a blind-baked crust. I used my favorite pie crust recipe, which is not very different from the Elsen sisters’ version. After eating the finished product, I thought the crust was a little overdone. I think in the future, I will only partially blind-bake the crust (as I did with the Lemon Lime Chess), so that the crust doesn’t get overcooked when baking the filling. Anyhoo, pour the crust into the prepared, slightly cooled crust. See? That crust is like 100% cooked already and I’m about to put it back in the oven to become at least 150% cooked. Let it cool for at least an hour and then sprinkle the top with sea salt flakes. I really love sweet/salty combinations, so I went on the heavier side with my salt, but you can use as much or as little as you choose. Although, if you go really light, then I think you’re missing the point of the Salty Honey Pie. I had some people over on Saturday night and served this for dessert. The general consensus? YUMMY. It was super duper sweet, but the salt helps to cut the intense sugary flavor. The texture is smooth and creamy and lovely. Apart from the aforementioned crust issues, I thought it was pretty durn good. In keeping with the whole Building My Pie Recipe Collection Project, a couple weeks ago I tried a new recipe. Taken from Ashley English’s A Year of Pies, Lemon Lime Chess Pie is a seasonally appropriate sugary, citrusy, custardy, zippy delight. 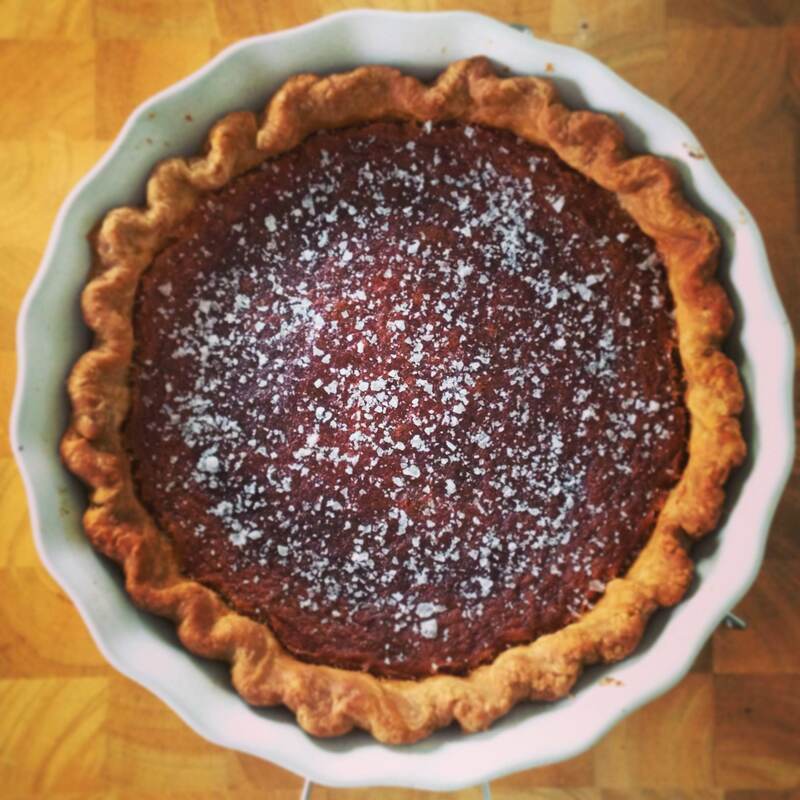 Traditional Chess Pie is essentially a mixture of eggs, sugar and butter. It is sweet and oh-so-rich. I absolutely LOVE it, but I know some people find it a little too intense. The addition of lots of citrus in this recipe cuts the sweetness and makes it more like a lemon tart. 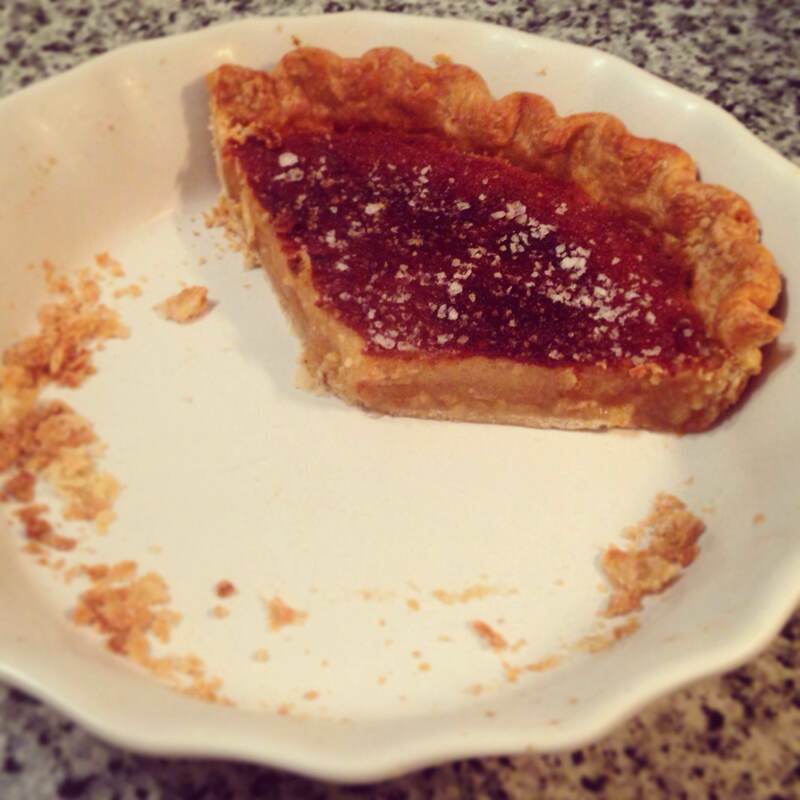 Incidentally, do you know why it’s called a “chess” pie? There are a few different guesses, but according to Ashley English, they were probably originally called “chest” pies, describing pies with so much sugar they could be cooled and stored in a pie chest rather than refrigerated. Interesting, right? Anyhoo, just a little factoid for you…now on to the making and baking. Let’s talk about crusts first. If you want to use a pre-made store bought crust, that is just fine by me. I’m not a snob about it, so do what you like. I don’t know your life. Personally, I like to make my own crusts, and I use Paula Deen’s Perfect Pie Crust recipe. I know she has seriously fallen out of a favor recently (deservedly so…racism = not cool), but that doesn’t change the fact that this pie crust recipe is quite good. It’s for a double crust, so I halve it for recipes like this one that only require a bottom crust. 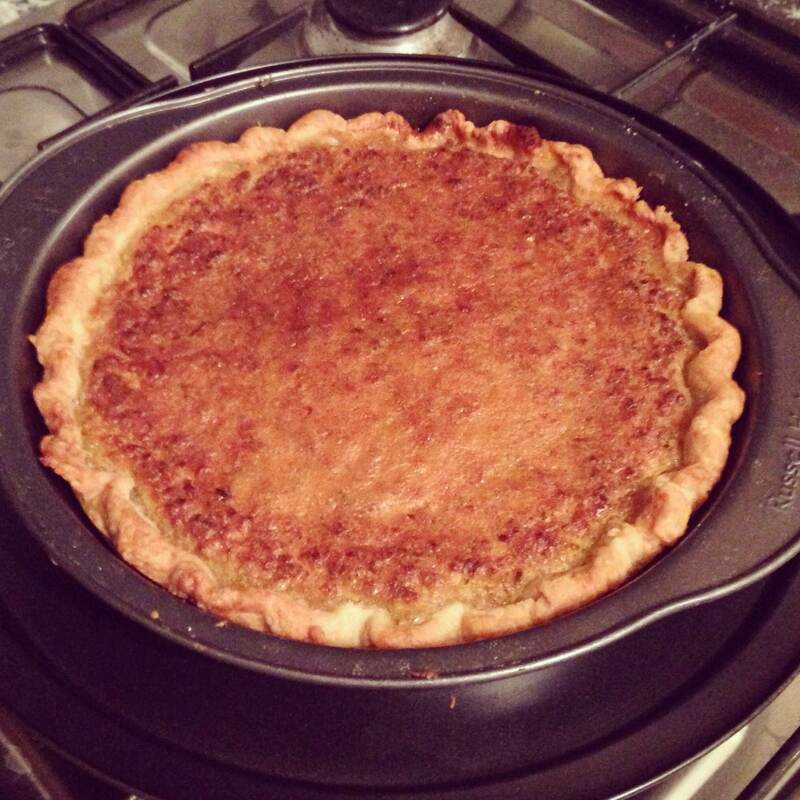 Ashley English’s recipe does not call for a blind-baked crust, but these days I am in constant pursuit of a non-soggy bottom on my pies. I had a really horrible apple pie experience at Thanksgiving where the crust was basically still raw on the bottom. Soooo, I decided to pre-bake my crust just slightly. I blind-baked it with pie weights for only about 5 minutes, and then for another 3 minutes or so without the pie weights. The crust was far from completely cooked, but blind-baked set it up and got it a little bit on its way before I added the filling. I think it made a positive difference, but you could certainly just pour the filling straight into a cold, uncooked pie crust. If you blind-bake, set the crust aside to cool while you prep the rest of the pie so that it’s not piping hot when you add the filling. Now on to that filling! 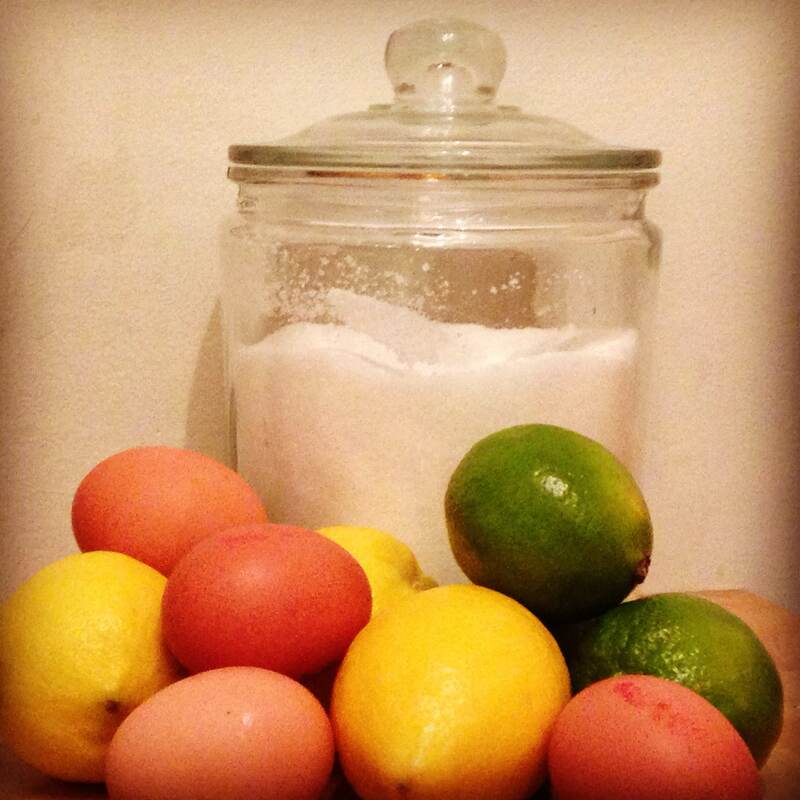 Basically, you need a whole lotta sugar, lemons, limes and eggs. The other ingredients seem negligible in comparison. 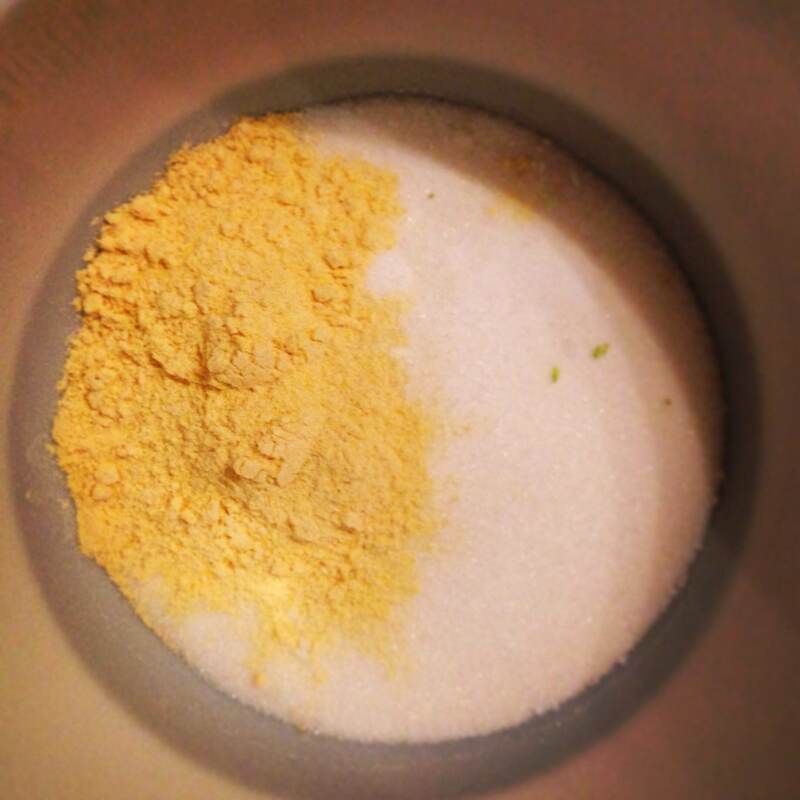 Combine the sugar, salt and cornmeal in a large bowl. Even though I said above that the non-sugar/citrus/egg ingredients seem negligible, I actually think cornmeal is a critical ingredient in a chess pie. Those few tablespoons give the filling a pleasant little bit of texture and help the top to get a little bit of a crunch that contrasts nicely with the custardy smooth filling beneath. You can leave it out if you don’t have any or if you object to cornmeal for some reason, but I really think it adds something so I wouldn’t leave it out unless you have to. 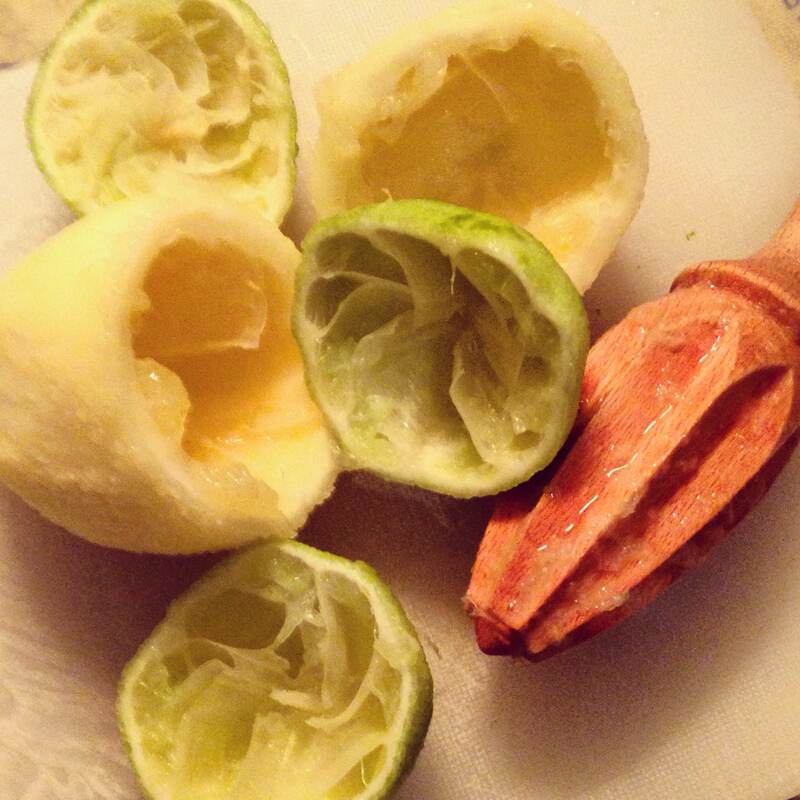 Set the dry ingredients aside while you melt the butter and put some muscle into zesting and juicing your lemons and limes. 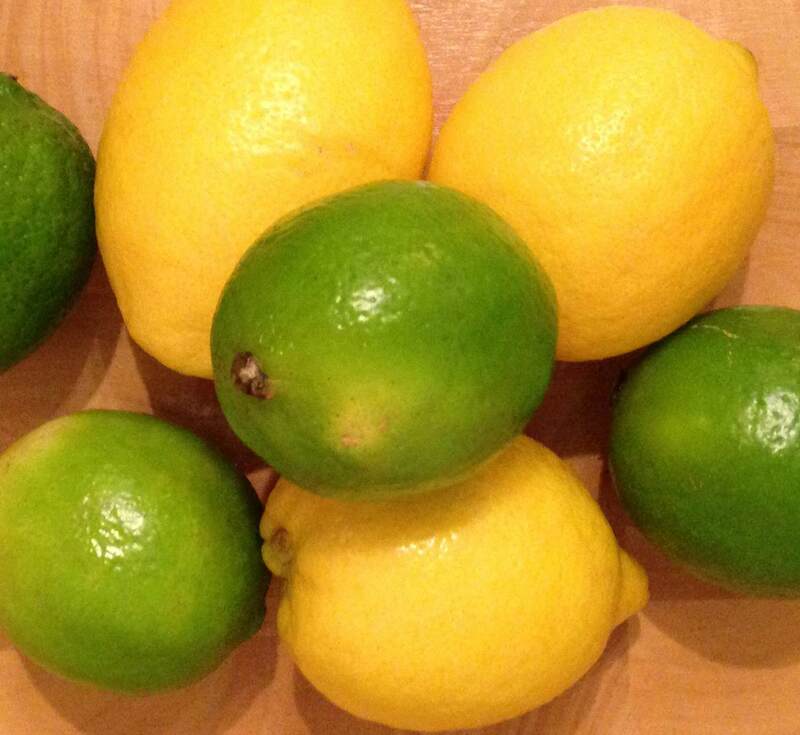 I used the zest of 2 lemons and 2 limes and the juice of about 1.5 lemons and 2 limes to make up the requisite amounts. 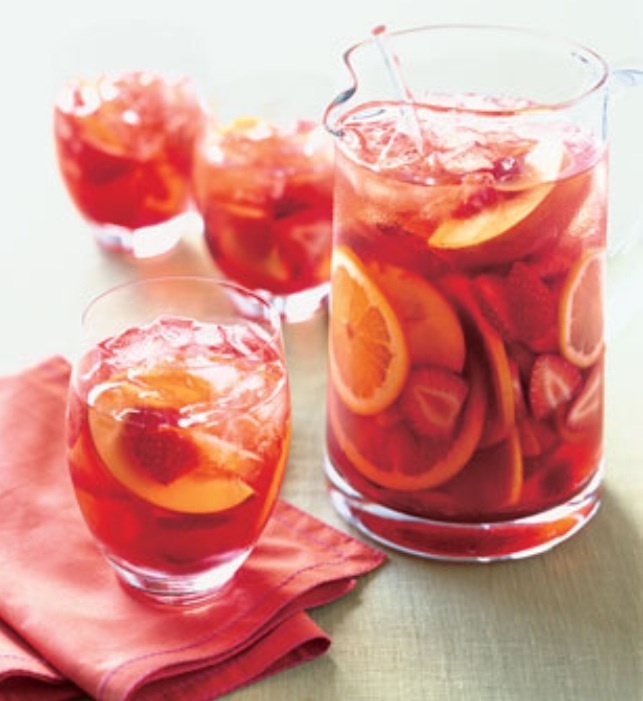 You may need more or less than that depending on the size of your citrus. 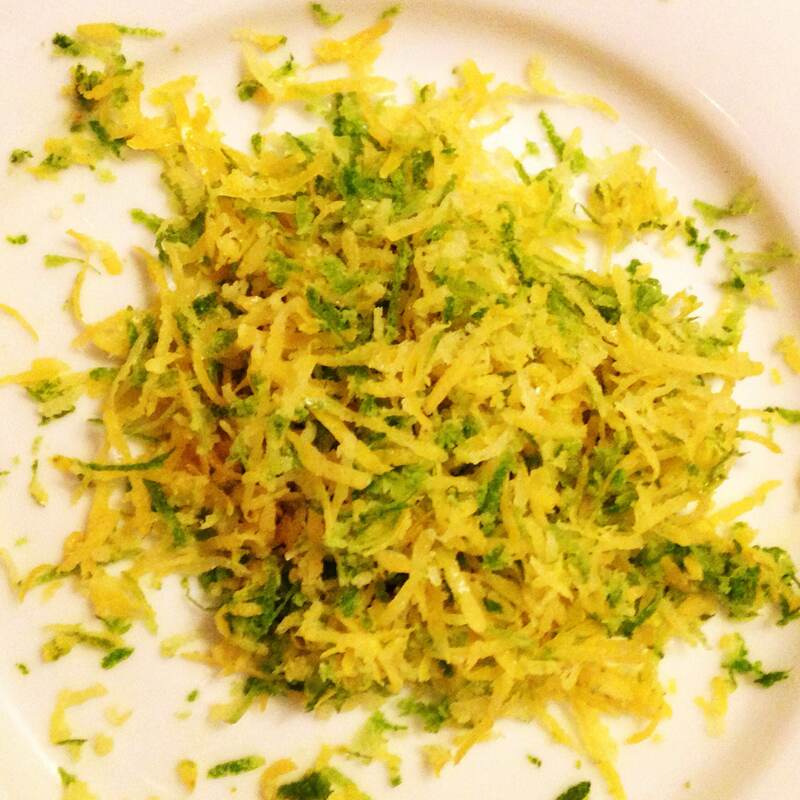 Add the melted butter, eggs, citrus juice and zest to the dry ingredients and whisk it all together. Bake at 350F (180C) for 40-45 minutes or until set but still a little jiggly-wiggly in the middle. It’ll set up the rest of the way as it cools. If you don’t want the top to brown too much, then cover it with foil part way through baking. I didn’t really mind some color (and crunch!) on the top of my pie, so I didn’t cover it at all. Maintaining a bright, vibrant yellow color after baking would be nice though, so do whatever you like. Pretty durn tasty. Tart and sweet and smooth with just a little texture throughout. Yum. This one’s a keeper. 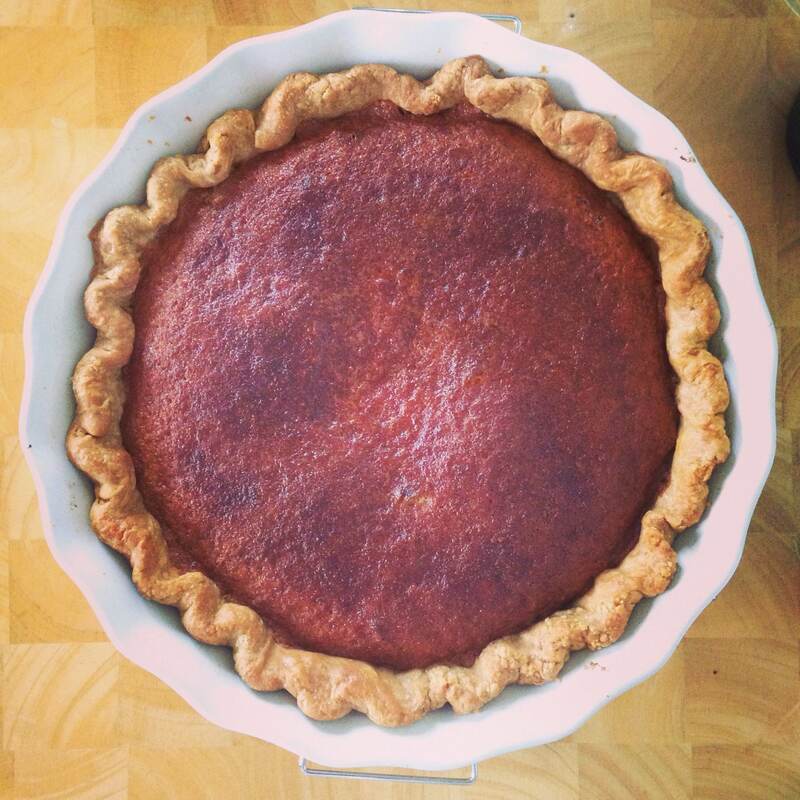 Do you like chess pie? Have you tried any other variations on the classic version? You may have gathered from some of my previous posts, but I like food. I like to cook. I love to bake. And I really enjoy trying new recipes/types of foods. As I mentioned in my croissants post, whenever I attempt something new in the kitchen, I tend to do a LOT of reading/research on the subject. I check several different websites; I print off two or three recipes; I read cookbooks. 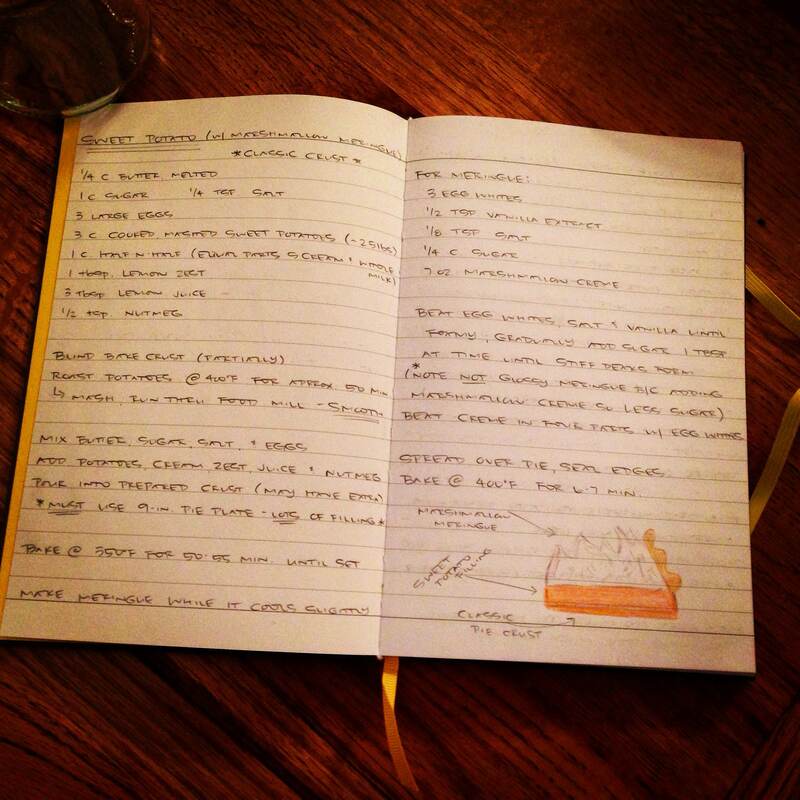 Then I try to synthesize all of that into one recipe. Sometimes this works, sometimes it doesn’t. Even if I follow a recipe faithfully, I usually think of a thing or two I might tweak if I make it again. 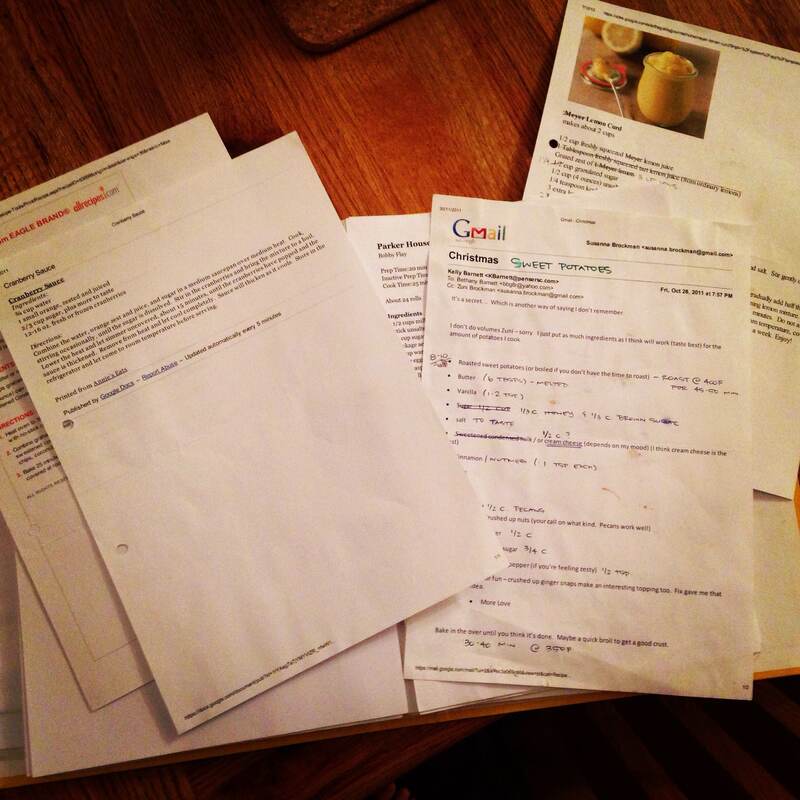 If it’s a recipe I’ve printed from a website or email, sometimes I’ll make a note on the paper and file it away for later. I have a binder specifically for this purpose, where I keep recipes I’ve printed, used and liked. More often, though, I don’t make any notes. I always assume that I will just remember the next time I use the recipe. This is rarely the case. I might have a vague recollection of doing something differently, but no record and therefore, I’m basically back at square one. My practice of fusing recipes, scribbling notes (or not) and shoving bits of paper away for later use was developed when I started a pie baking blog a few years ago. 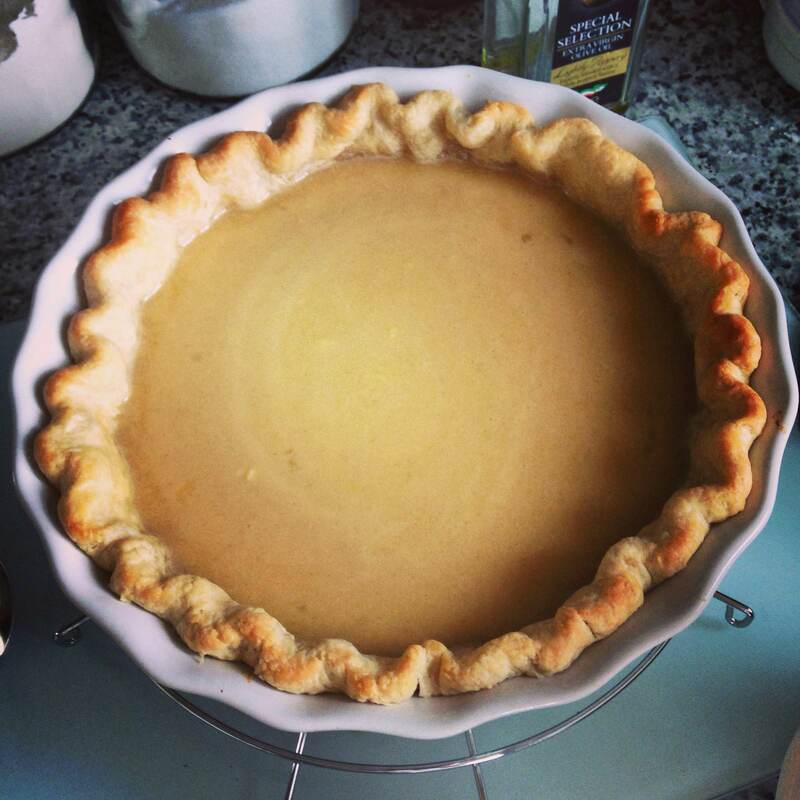 I won’t get into all the reasons WHY I decided to start my sweet-dessert-American-style pie baking project (for that, go read the History and Why Pie? 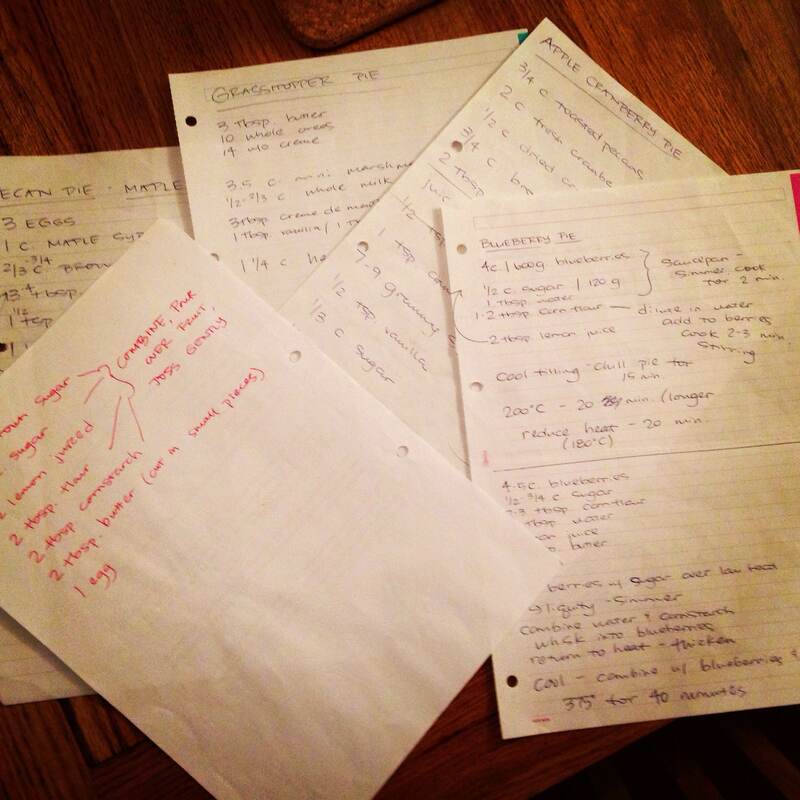 posts), but suffice it to say, my pie recipes tended to result in a jumble of scrawled ingredients, methods and ideas. The “pie” section of my recipe binder has a decidedly more Beautiful Mind vibe than the rest of my recipes. So why am I telling you all of this? Well, I’m trying to get better about making notes when I try a new recipe. I did a good job of this with some lemon curd I made last summer. I synthesized a couple of recipes and changed some amounts (since the recipe called for meyer lemons and I only had regular ones). The result was absolutely deeeelicious, if I do say so myself. I made a point of noting the alterations and I am so glad I did. I made it again recently and it was just as awesome as the original batch. I know if I hadn’t made the notes, I would never have remembered what I did. My desire to keep better records also comes with a renewed zeal for pie. I had cooled on my passion project over the past year. I wasn’t really baking many pies; and the ones I did bake, I couldn’t be bothered to photograph or blog about. 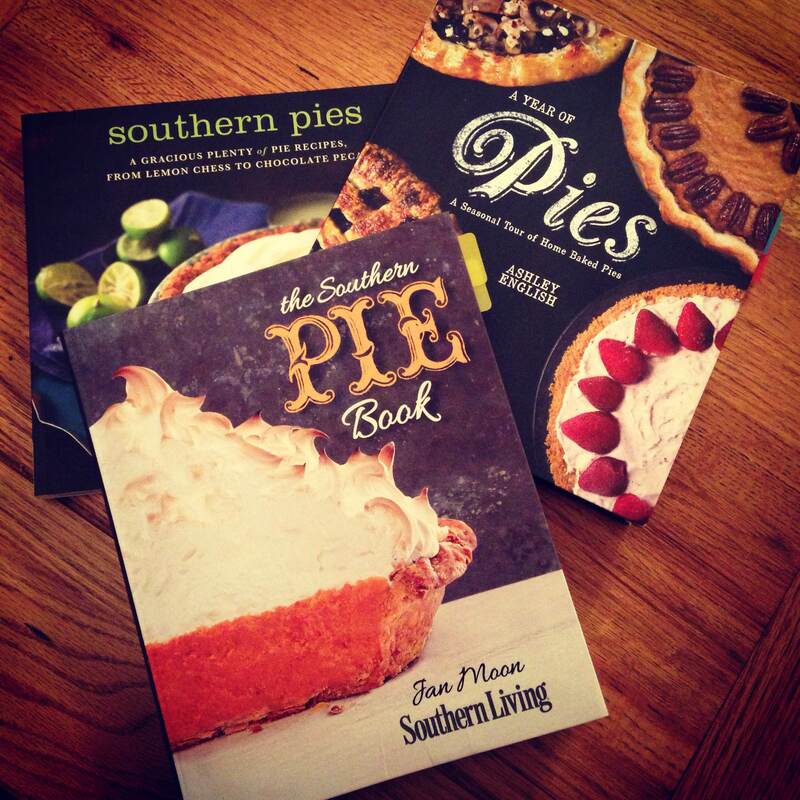 But Bethany gave me a great pie cookbook for my birthday (The Southern Pie Book, Jan Moon). Flipping through the recipes made me revisit my other pie cookbooks, which started me brainstorming about new recipes to attempt. My renewed interest has also prompted me to keep a better record of the recipes I try and any notes/tweaks/changes/thoughts I have about them once I’ve baked and tasted them. So I invested in a little journal that I am going to use for all my pie attempts, thoughts and reviews. The goal is to record each recipe I’ve tried, any important things to remember for the next time, any changes or variations I might want to try for the future, etc. etc. For example, I made a Sweet Potato Pie with Marshmallow Meringue a couple weeks ago (I think it might be the one featured on the cover of the above book). The recipe makes SO MUCH filling and I used a slightly smaller pie plate than usual, so I had enough extra filling for nearly a whole other pie. I made a note to remember to use a full size 9-inch pie plate when I make the recipe in the future. If I don’t have one, I’ll know I need to reduce the amounts. Hopefully making notes like this will help me to build my pie catalogue and perfect each recipe instead of reverting to square one every time I bake one of these wonderful desserts. And if I have the space, I’m even drawing pictures of the finished product. What? It’s an artistic outlet! How do you organize your recipes? Do you have any recipes that you’ve altered over the years to achieve the perfect version? Remember my post on the Duffin and it’s creator Bea? Of Bea’s of Bloomsbury? And remember how sad I was that the diner location that operated near my flat had closed? Turns out, there is a MORE than acceptable reason for that diner location to close: Bea is working on opening it in a permanent location, under the name Stax. There she will serve not only delicious pancakes, french toast, and The Best Bacon in London, but also burgers and other American fare. Last Monday night, I was privileged to go to a preview night for that diner, where Bea and her team served up some sample burgers and other yummy items. 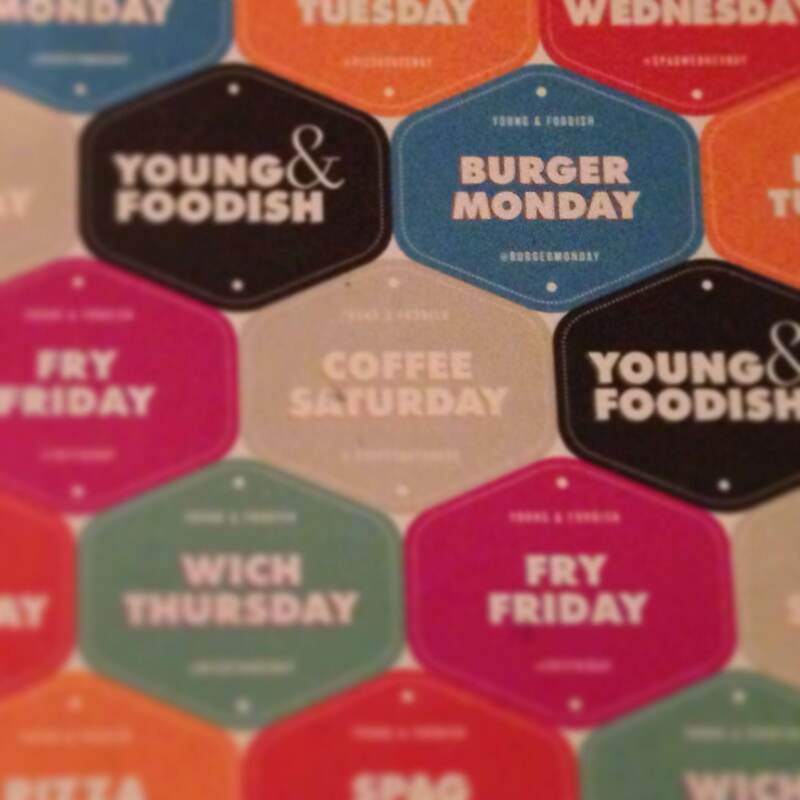 The evening was hosted by Young & Foodish, as a part of the Burger Monday series, which is exactly what it sounds like…burgers served on a Monday by various chefs/restaurants. There’s also Pizza Tuesday, Spag Wednesday, Wich Thursday, Fry Friday and Coffee Saturday. My ticket for this particular Burger Monday featuring Bea’s delicious food came courtesy of Louise, who didn’t feel that her organizational role in the Best Birthday Surprise Ever was enough of a birthday present. She treated me and another friend, Sarah, to Bea’s Burgers as a belated gift. Wonderfully, the burger was not the only amazing treat on the menu that night. Our meal started with Bea’s version of an AWESOME BLOSSOM. 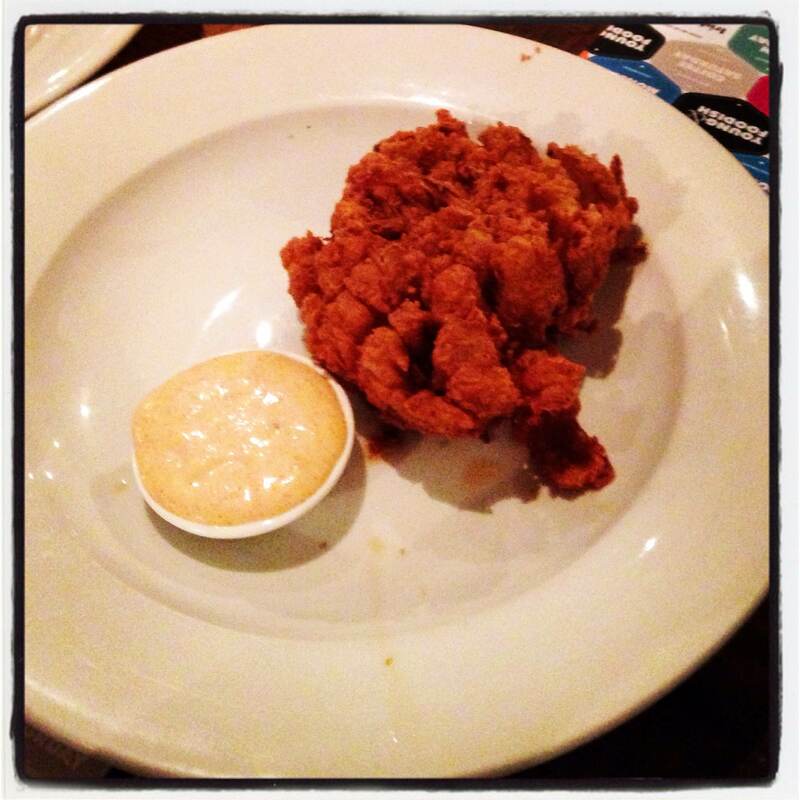 American readers will know all about this fried delicacy, but it has yet to transfer across the ocean, so I had the joy of witnessing three people (friend Gareth was also with us) indulge in this amazing taste experience for the first time. And of course, I had the pleasure of enjoying it myself. Bea’s version was different from the typical Outback Steakhouse or Chili’s version (as you can see from the image above). The onion was smaller, but we were served one between two, so the smaller size still meant we each got more than enough. The fried bits were thicker and crispier and spiked with something slightly spicy, all of which made it even better than the mass-produced versions at chain restaurants. And the spicy mayo dipping sauce was deeeelicious. 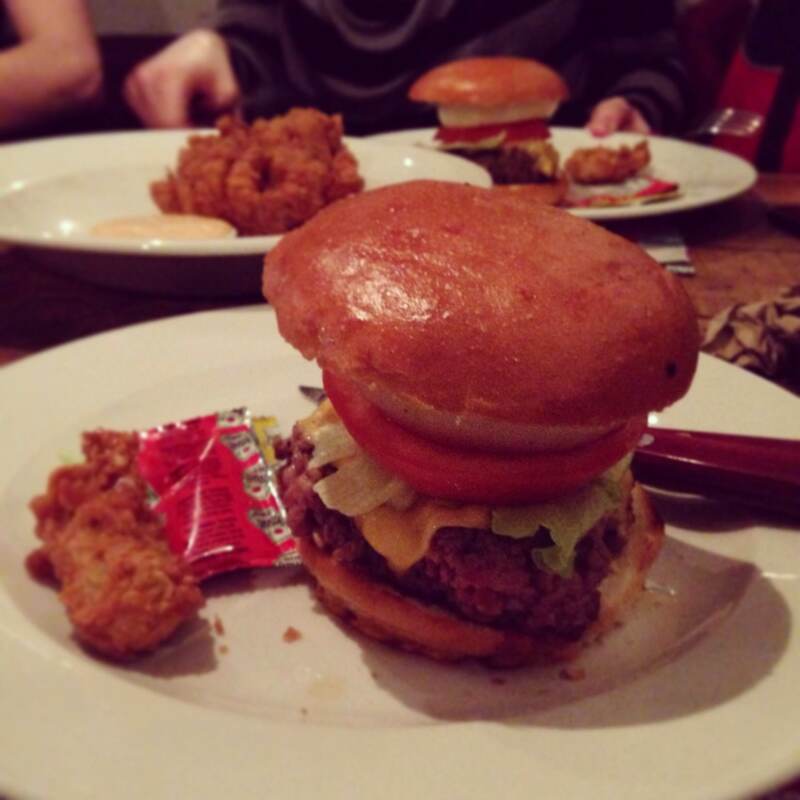 Then came the burger. They were large and glorious looking. The grilled onions and tomatoes were thick cut, the beef was substantial and perfectly crumbly, the cheese was all American. Overall verdict: yummy. After we were totally stuffed with burgers and awesome blossoms, we were presented with dessert. And what else would Bea serve than her signature creation? Yep, that’s right, it was a duffin. 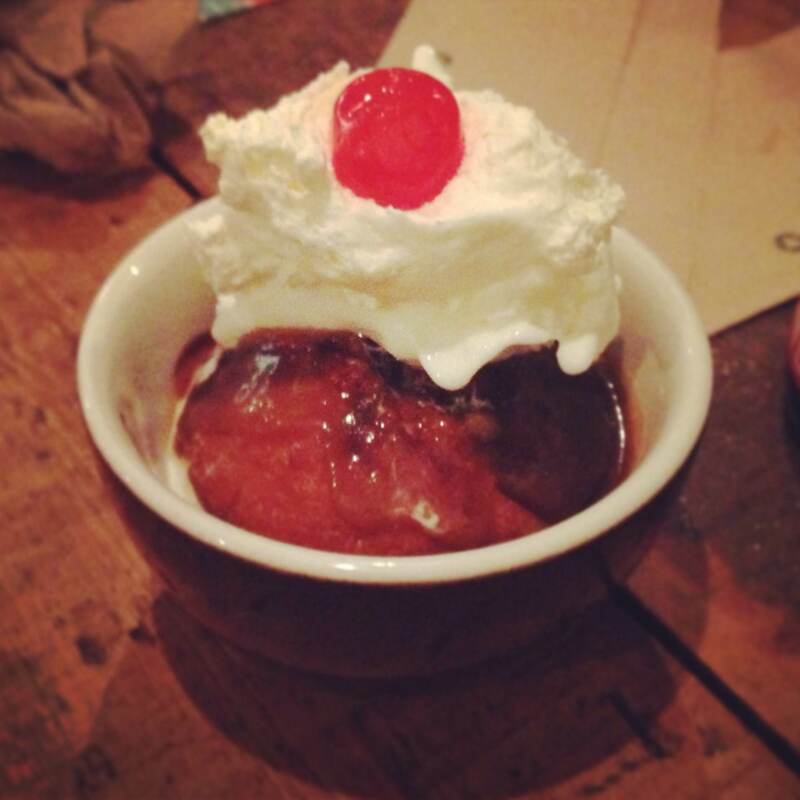 This duffin came as part of an ice cream sundae, though – drenched in caramel and hot fudge sauces, topped with ice cream, whipped cream and a maraschino cherry. It was incredible. Even on an already overstuffed stomach, I just couldn’t get enough of it. So so so good. 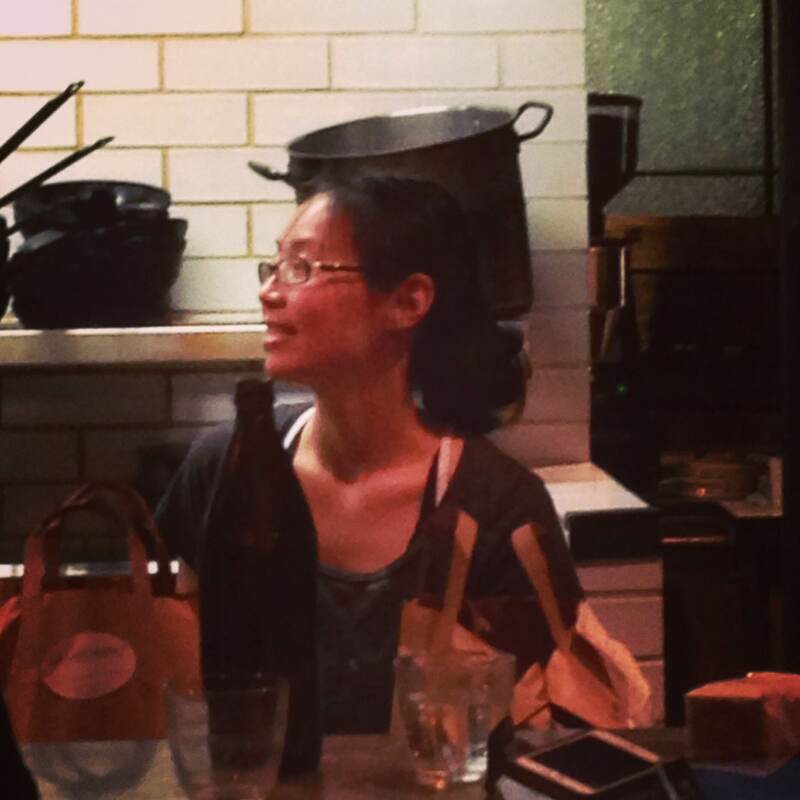 After the meal, Bea gave a little spiel about her vision for the diner and for American food in London. I was sitting pretty much directly across from where she was standing. Besides very obviously taking pictures of her while she spoke, I kept making little squealy, gaspy noises of delight. I’m quite sure she thought I was completely insane. I was totally fan-girling and geeking out over her, since she’s basically living my dream and I want to be her and everything she bakes/cooks/does is amazing. 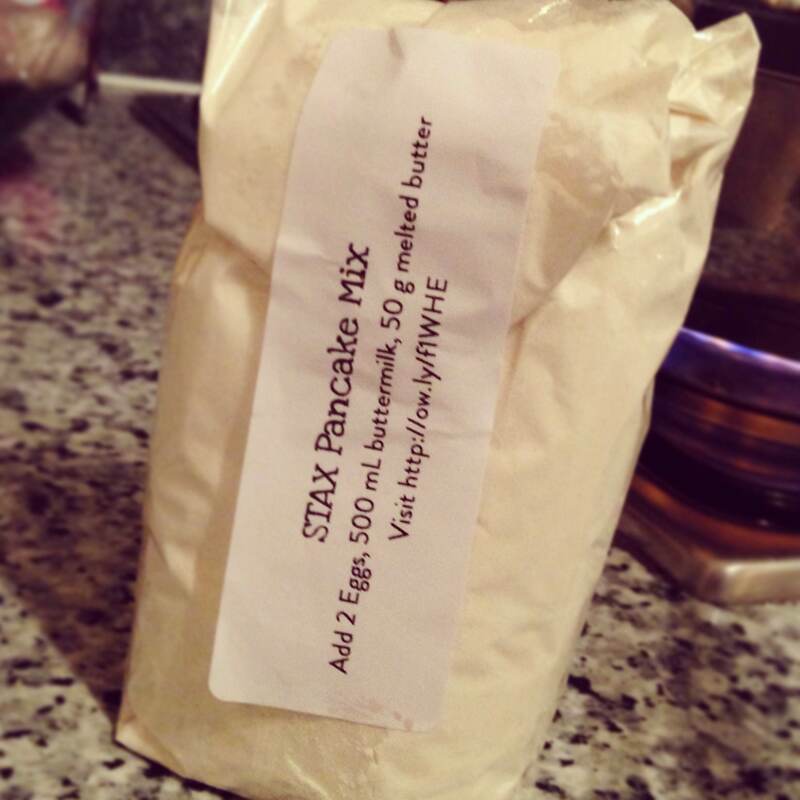 As a special bonus that night, since it was the day before Pancake Tuesday, we were each given a little Stax Pancake Mix before we left. When Bea came around to our table to drop off our mixes, I got the distinct impression that she couldn’t put them down and get away from our table fast enough. I think she knew that if she stopped to chat, I would never have let her go and probably ended up hugging her inappropriately or trying to hold her hand or something. I can’t say that I blame her. The next day, I took a special detour to one of the bigger grocery stores on my way home so I could get the buttermilk necessary to make the pancakes that night. 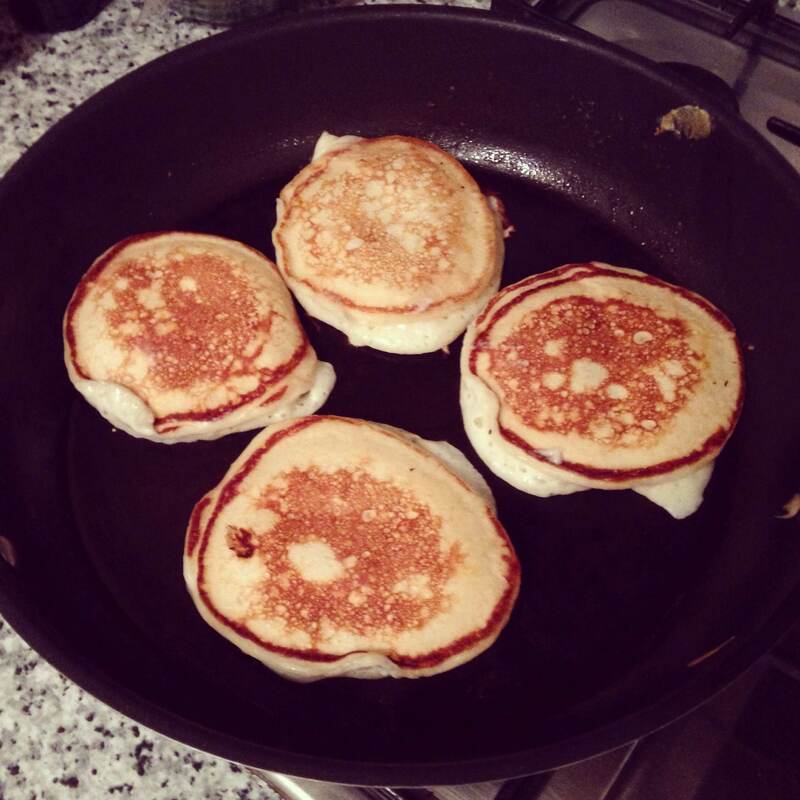 It was a pleasure to enjoy some delicious American-style pancakes with real maple syrup for dinner. Just extending the tastiness of the night before, and increasing my love for Bea. Seriously, Stax can’t open soon enough. Please let it be somewhere near my flat again. I promise I won’t geek out too much when I visit, Bea. Maybe. Well folks, I did it! Another item checked off my 35 Before 35 List! I finally made spaghetti sauce from scratch! And while it wasn’t fast, it wasn’t a hard process and the end result was so yummy-yummy-yummy-in-my-tummy-tummy-tummy that I will definitely do it again. After finally scoring the “recipe” from Carla, I went grocery shopping last Tuesday and bought most of the stuff to make this sauce. I figured if we were gonna be sitting around waiting for the baby, we might as well eat well. But Mac arrived before I got my sauce-making-act together! 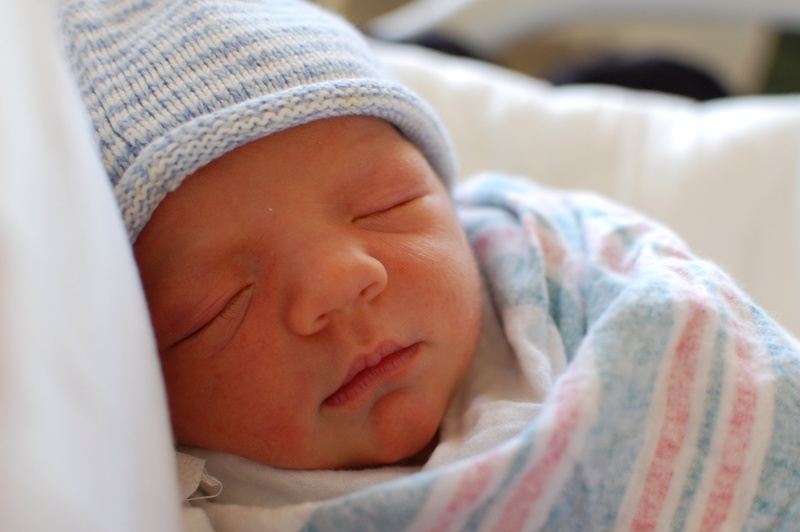 Sorry – can’t resist sharing another shot of his precious mug! Sigh… Cuteness. Anyway, when we had a snow day on Monday, I decided to make the sauce my husband warned me that I better get my rear in gear and make some sauce before the tomatoes went bad. Okay, he said much nicer than that, and he was right – and a snow day was a good day to tackle this mission. 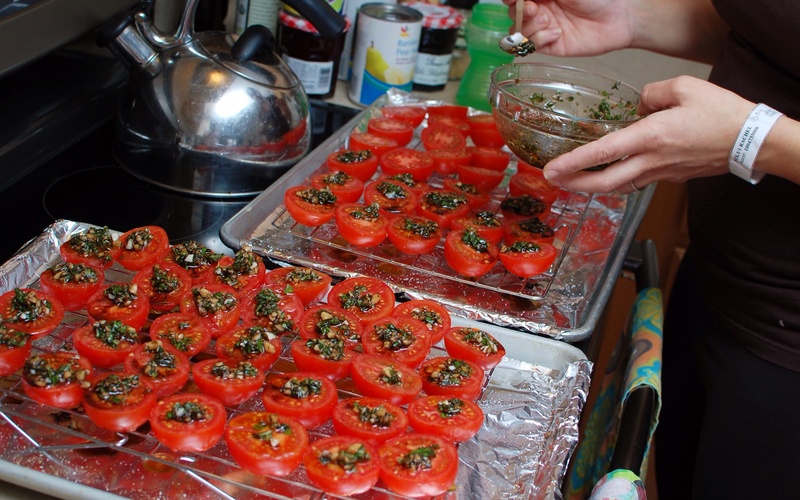 Anyway, to begin making this sauce, you first slice tomatoes in half and place them cut side up on cooling racks on parchment paper (we were all out so I used aluminum foil) on cookie sheets. I used about 30 vine ripened tomatoes ’cause I couldn’t find any good plum tomatoes like the “recipe” called for. Salt and pepper them. 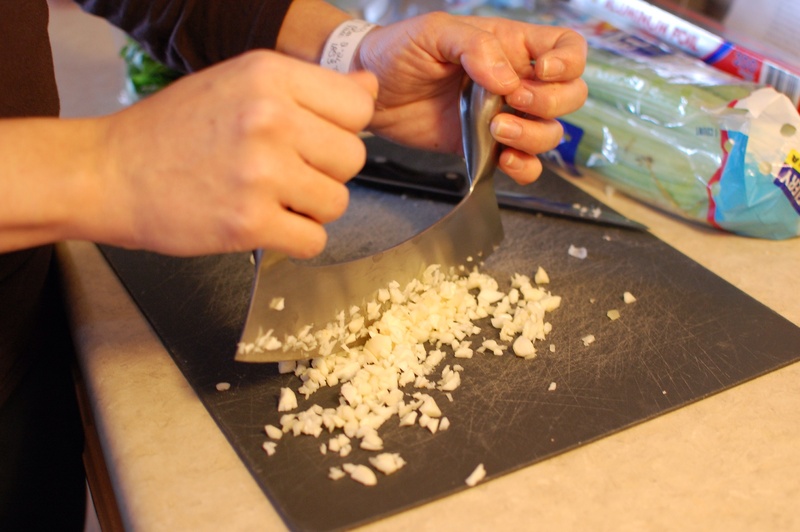 Then chop up your garlic (ideally while still wearing your hospital ID bracelet and using your POTY chopper thing from Susanna). I used about 8 cloves. Chop up fresh basil (or you could also use tarragon) and combine the garlic and basil with olive oil and balsamic vinegar. I did a very large handful of basil that chopped down to about 1/3 cup. I used a little under 1/4 cup of balsamic vinegar and a little over 1/4 cup extra virgin olive oil. I think that was too much EVOO. Live and learn. 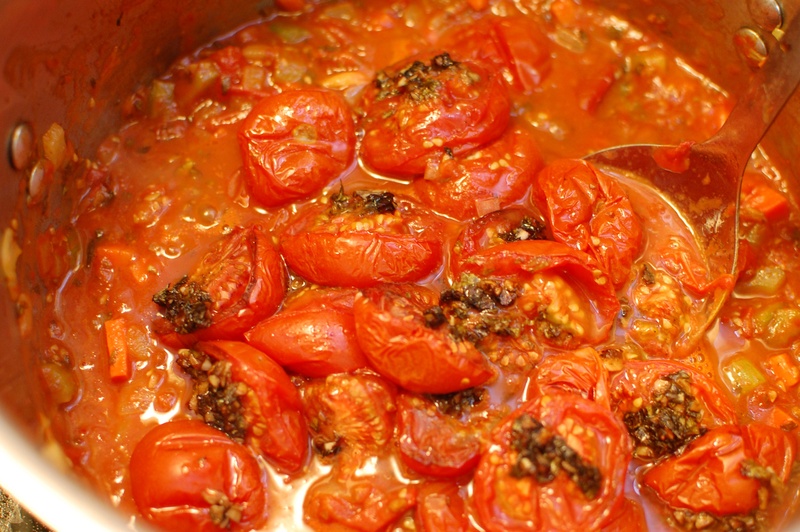 Spoon this mixture on to your tomatoes and toss them into the oven for “a couple hours” at 230 degrees. I left them in there for three hours. 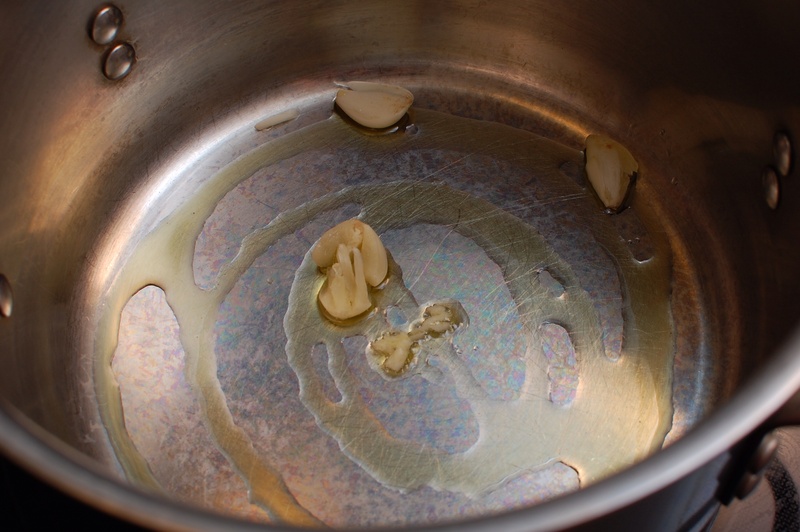 The next step was to sauté crushed garlic in olive oil. And then add onions. 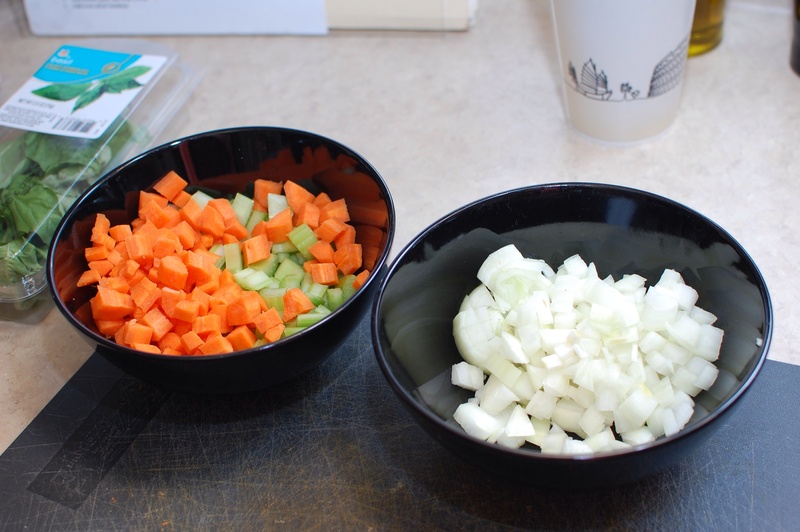 The “recipe” says nothing about adding diced carrots and chopped celery (I chopped a cup or so of each – next time I might do a little more) but those are listed in the ingredients and when I made the batch with Carla, those were key. So I sautéed the garlic and onions and then added the carrots and celery. In retrospect, I would have added carrots and celery before the onions or at the very least at the same time as the onions. They were a little underdone and thus didn’t blend into the sauce as much as I would have liked when I got to the food mill step below. Next step is to add some tomato paste (I did about 4 oz.) and cook it a little. Pretty straightforward so I didn’t get a shot of that. 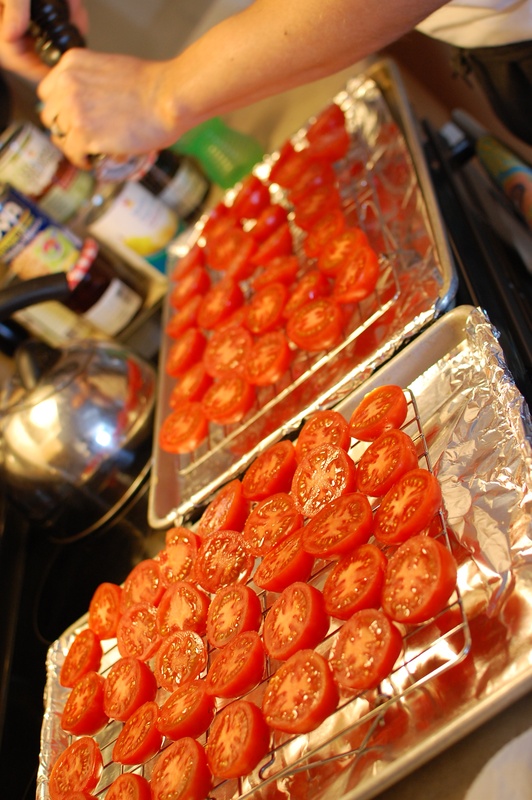 Then pull your most-amazing-smelling tomatoes out of the oven. These puppies would be really yummy served bruschetta-style on some crusty Italian bread. Nope, it’s not stale ginger ale. Nope, not iced tea either. It’s white wine. Apparently when it snows all the liquor stores in Bowie close their doors. 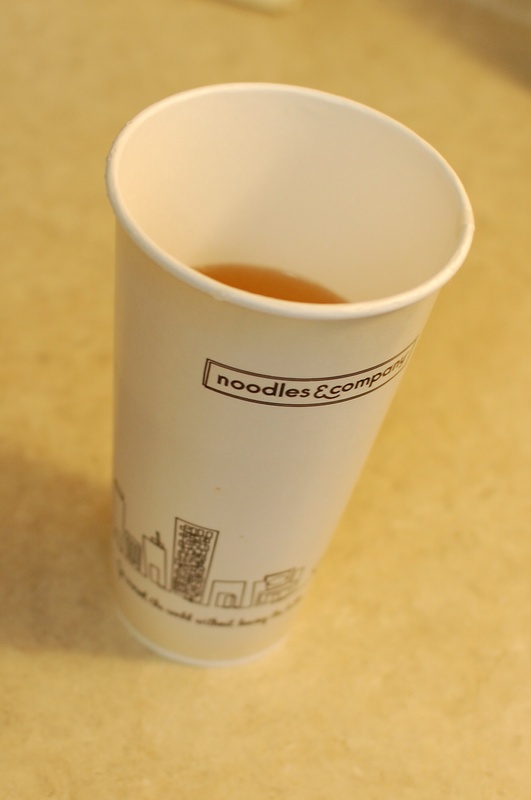 My sweet hubby went to four of them then came up with the plan to get some wine from Noodles & Co. Who knew that they even had wine, let alone that you could get a to-go cup?! Let your sauce simmer for a bit (I cooked it on medium heat for about 20 minutes) and stir it occasionally. You can add tomato sauce here if it needs moisture. I didn’t know how to tell if it did so I added some. Mine probably didn’t need it ’cause of the extra olive oil I added and the extra carrots and celery I should have added. Add some salt, pepper and sugar to taste, then put it through a food mill into another pot. 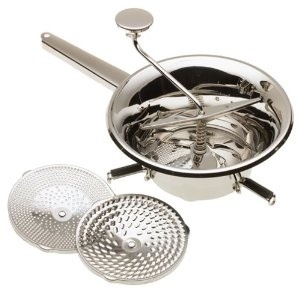 Thankfully, Carla had just purchased a new fancy food mill so she gave me her “old” one (similar to the one above). It still looked new and it worked perfectly! 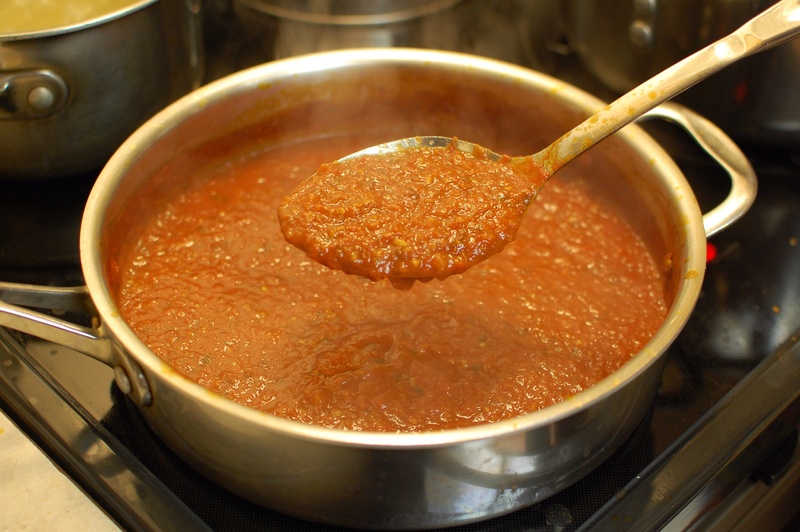 Let the sauce simmer a little longer to really mix those fantastic flavors together. Adjust salt, pepper, and sugar again if necessary. I let mine sit for another 20 mins. or so because it was pretty liquid-y, but once again, I think this was my fault for not interpreting the “recipe” better. Here it is again in all it’s finished glory. I didn’t get a picture of us eating it because making it took a little longer than I expected and we were all quite ravenous! But the reviews by the kids and hubby were 100% positive. The only negative was that I could have made more for leftovers. Bottom line is, even with all the little things I will correct next time, this sauce beats any you can buy in a can (even my stand-by spaghetti sauce Newman’s Own Tomato Basil Bombolina) and I love the idea of making it again and again and again and tweaking it into a true recipe (no quotation marks this time) that our family adores. 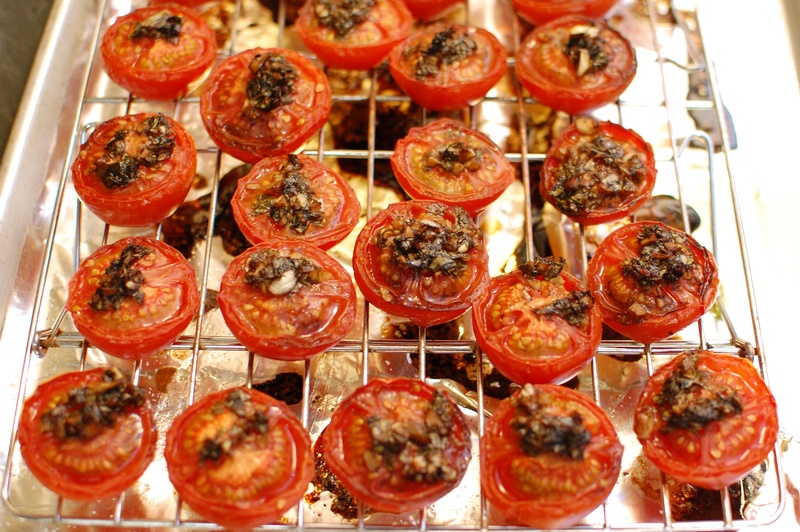 Are you perfecting your own family heirloom recipes? Learning to make your own sauces? Your own pasta? I might have to try that next time I make this sauce!